This is the place for all you Blackmore maniacs out there. 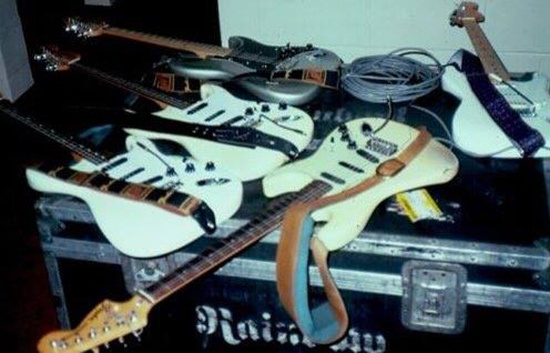 You will find a lot of pics and information about Ritchie's gear from the past. For Ritchie's classical Deep Purple Mark 1 and 2 sounds 1968-1970 and most notable on the 1972 Deep Purple "Made in Japan" album, the BSM HS-C is the perfect pedal. If you want to get your sound the way Ritchie played highly dynamical and transparent around 1971 or 72 captured in some Radio or TV shows like "BBC In Concert 1972", "Beat Club 1971", his glassy crisp sound in 1973 (New York show) or even "Stormbringer" use the BSM 71/73 CM to get the most versatile and transparent crunch available. For a general Blackmore tone like with Rainbow, the Deep Purple Reunion, the 90´s Rainbow Reunion or Blackmore's Night BSM developed the RPA Special Booster, a 9/18 volt emulator of Ritchie's AIWA reel-to-reel tape recorder pre-amp stage plus the high-pass treble booster function from Blackmore's hot-rodded Marshall Major amp. The BSM RPA California has been created especially to emulate Ritchie's 1974-75 Deep Purple Mark 3 sound he got from his AIWA reel-to-reel and different Marshall Major preamp-mods. You can get his "California Jam", "Live in London" and "Made in Europe" sounds with the twist of two knobs. 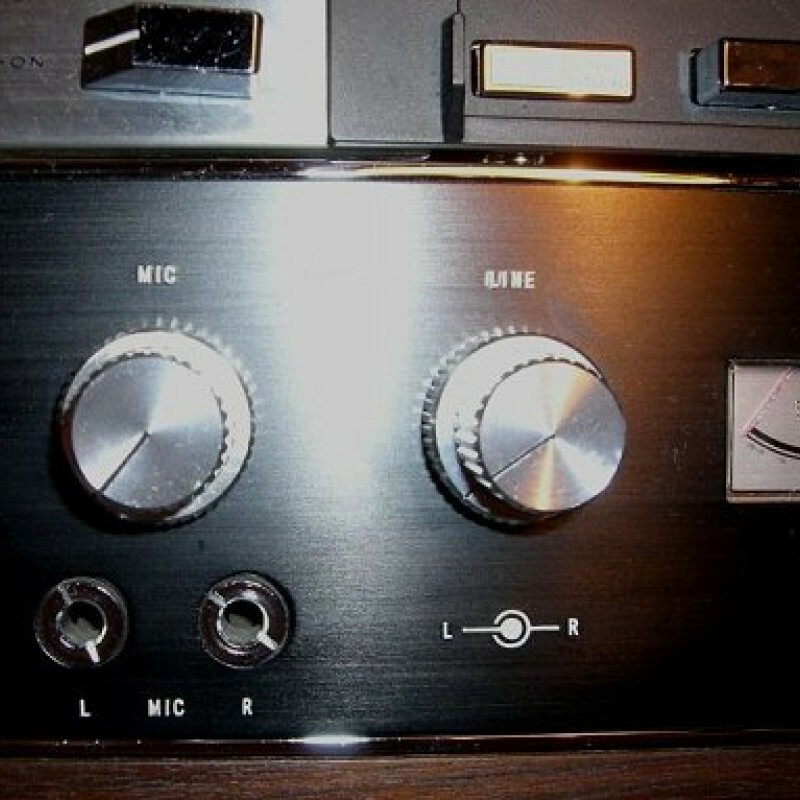 Especially for the aggressive 1976-1978 Rainbow live sound the BSM RPA-Major would be the right choice. It is a hot-rodded version of the RPA with lots of gain. As an alternative and to additionally match the studio tracks on "Rising", "Down to earth" or some of the tracks on "Fireball" get the BSM FireBall to tailor your needs. If you want to cope with most of Ritchie's tone just get the BSM 71/73 CM and the BSM RPA and you will be prepared for most situations. With these two Boosters you can mainly emulate the HS-C, HS-S but you cannot emulate these special two with the others. Right from the start of the Deep Purple Mk1 era in 1968, Ritchie Blackmore used his trusty 1961 cherry red Gibson ES-335 TD as main guitar alongside his Vox AC30 and a Hornby Skewes germanium fitted treblebooster. Midway sixties Ritchie modified this guitar with a Bigsby-Vibrato. The Gibson guitar was usually fitted with 2 Gibson PAF Humbucker pickups. 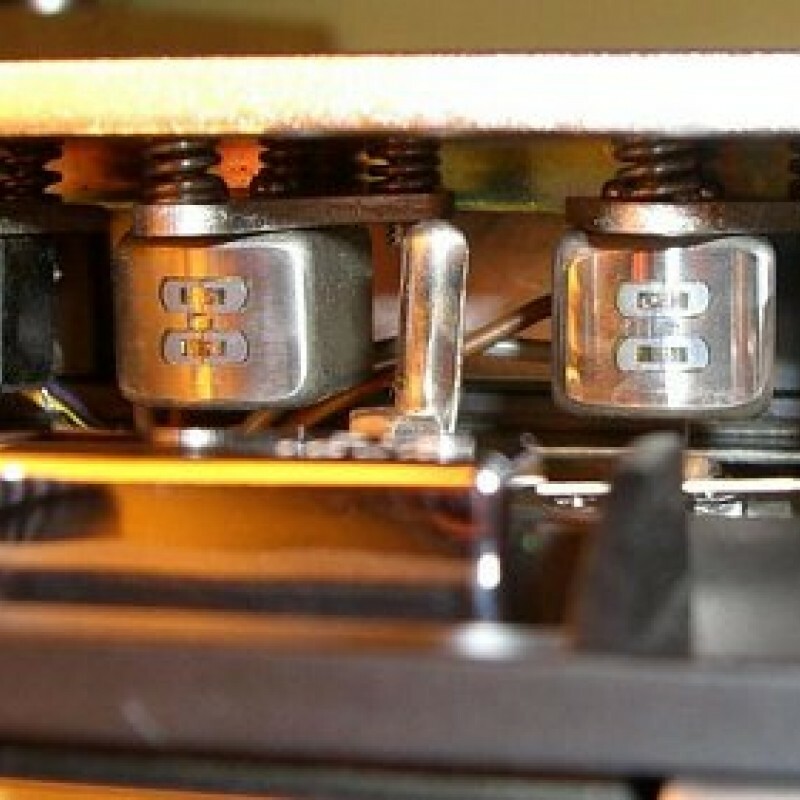 In one of the Humbucker’s coils there are 6 adjustable screws installed, one can balance the volume of strings among each other via varying the height. Ritchie now turned the screws uncommonly high so as to get a more P90-like sound. The coil with the screws picks up more voltage than the other. Ritchie will use this guitar on stage until midway 1970. In the studio the guitar stayed with him even longer, at least until the December 1971 "TOTP" TV session. 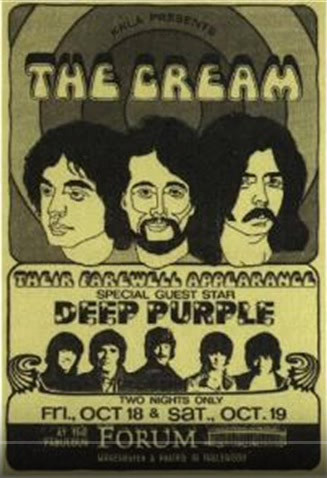 At the end of 1968, Deep Purple Mk1 was the opening act on the “Cream” tour in the USA. 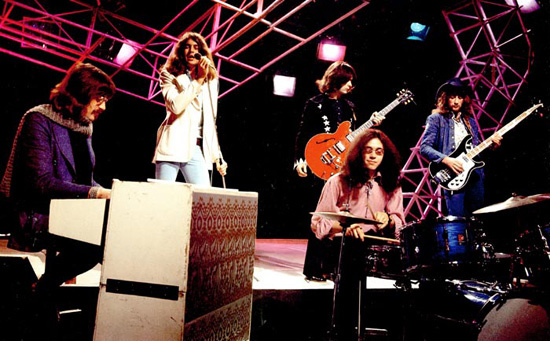 At this time Deep Purple was well known in the USA, but not in their home country England. It was the last tour for “Cream”, before the band felt apart. For Eric Clapton the situation was hard to handle, after Ritchie opened the concerts with his aggressive guitar show, the guitar orientated audience wanted to hear more Blackmore. So after only a few shows, Deep Purple were paid out to leave the tour. During these days, a retired Fender Stratocaster from Eric Clapton was given to Ritchie, and he soon fell in love with the sound. Especially the tremolo caught his eye, Compared to the Bigsby on his Gibson ES-335, this was a real enhancement. Not that Ritchie wasn’t satisfied with his ES-335, even Dave Edmunds (Love Sculpture) the shooting star of the upcoming Hardrock scene played an ES-335 with a Vox AC30. Edmunds by the way left behind most English Hardrock-guitar players with his ultra fast and enormous fluidly played version of “Sabre dance” in 1968. The combination of ES-335 and Vox AC30 was a “top act”. But since Hendrix arrived on the scene, everyone knew what could be done with a vibrato-system. 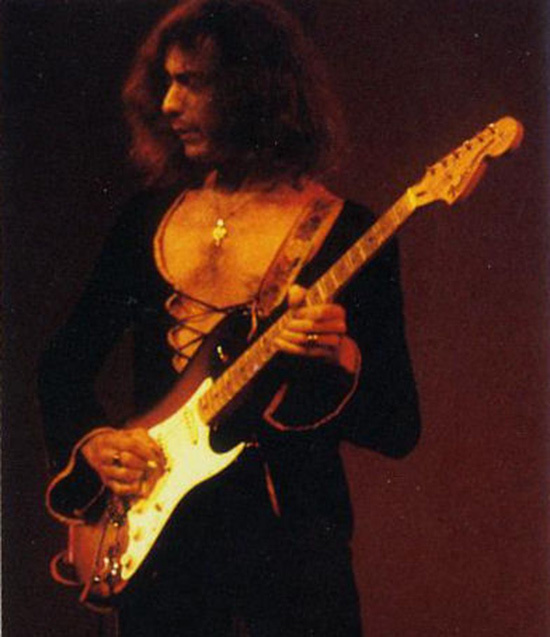 In spring 1969 Ritchie bought a stock 1968 black maple neck Stratocaster. The 68 Strats still had the two-piece old tremolo construction with the steel inertia bar and the stamped vintage steel saddles. For this tremolo, Ritchie used a special custom-made ¼" (6.3mm) heavy weighted steel arm, to attack the tremolo real hard. With the entrance of new members Ian Gillan & Roger Glover (better known as the Mk2 formation) as replacements for Evans & Simper Deep Purple’s rise to stardom began. Approximately for a year ES-335 and Strat were sharing equal rights. Typical live songs for the ES-335 were for instance the new “Child in Time” or the old “Wring that neck”. Midway 1970 the ES-335 disappeared from stage. 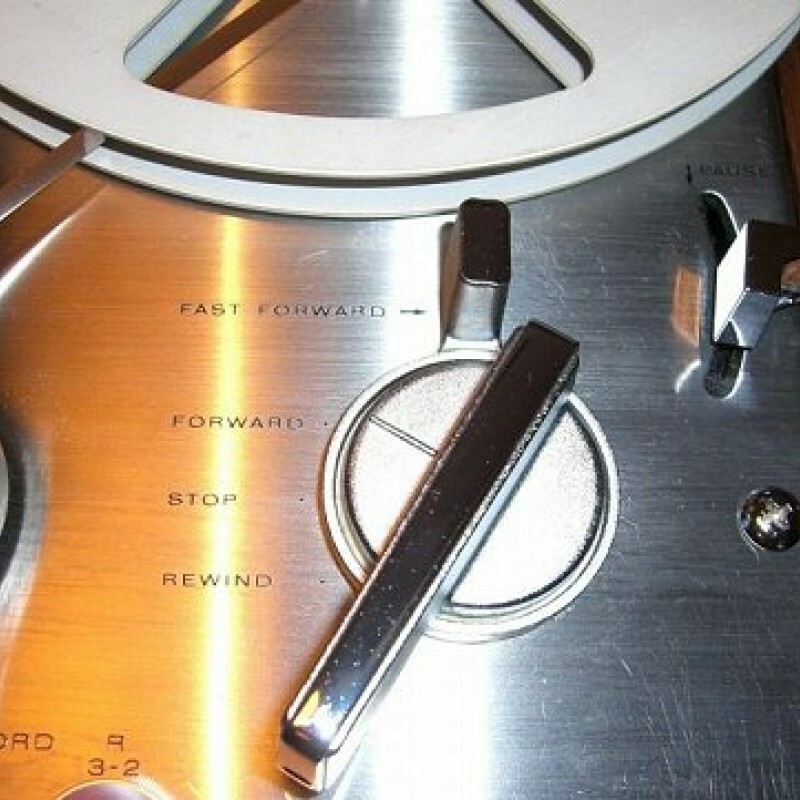 The legendary “Child in time” was recorded in the studio using the ES-335. At the end of 1970, early 1971 the worn-out frets of his Strat were replaced with the higher Gibson jumbo frets. The maple fretboard was not lacquered afterwards, so it became noticeably darker with time. This was the guitar alongside the now more rarely used ES-335, Ritchie recorded "Deep Purple in Rock" with in 1969/1970 and could well be the Strat he recorded the follower "Fireball" with during spring 1971. This black 68' Strat was Ritchie’s main axe until at least winter 1971. Another black maple neck Strat replaced it midway 1972. Ritchie will also use sunburst Strats regularly during the following years. At the beginning of 1971 a new 71´s sunburst Strat showed up, sporting a four-bolt maple neck with skunk stripe, two-piece steel tremolo, stock pickups and electrics. Like on his old black Strat the tremolo was as well customized to his specification: a heavy custom-made tremolo arm made of steel was fitted and a bigger hole had to be drilled into the steel block to hold the fatter arm. The lacquer of the fretboard was peeled off right from the start. This is the reason why the fretboard looked darkened after only a short time, but the frets stayed untouched. It is possible that Ritchie already tried a rudimentary type of scalloping here. The legendary “Beat Club” session from September 1971 was recorded with this sunburst Strat. The new 71 Strat had a more airy and pearly attack, something that Ritchie really liked and fell in love with more and more. It was used in parallel to his old black one during 1971. In late 1972, this sunburst axe was rather damaged at its headstock. He played this sunburst Strat until early 1973 than smashed it. 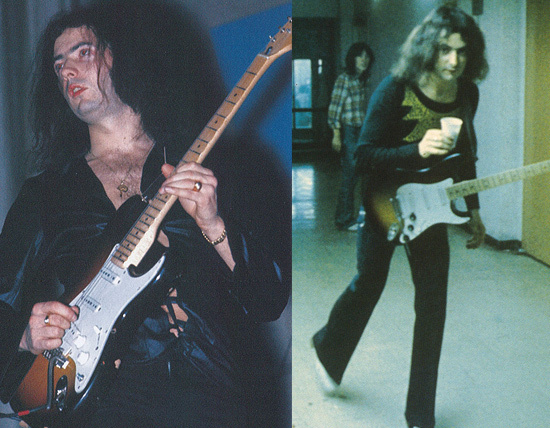 Blackmore himself said that he played scalloped fretboards since about 1971. 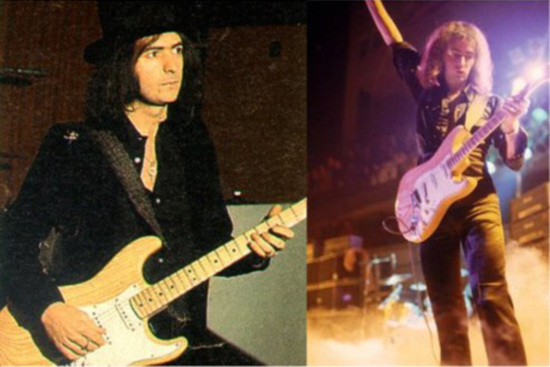 Therefore it seems to be obvious that Blackmore played live with an unpainted maple fretboard during the years 71 and 72. An un-lacquered maple fretboard sounds milder than a lacquered one. Midway 1972 a brand new stock 1972 black maple-neck Strat comes to operation. At this time, CBS-Fender invented a lot new features on the Stratocaster-model. At first the three-bolt neck attachment with tilt-neck feature, a possibility to adjust the neck if necessary to tilt the neck backwards in a smaller angle without using little pieces of wood to do the job. The adjustment screw for the truss rod went to the headstock, now known as the “bullet truss rod” to have it more decorative and easier to adjust. The value of the tonecap was reduced to 0.047uF. And of course the new diecast tremolo construction, which had a great influence on the overall tone. This tremolo was a one-piece construction and even the new rectangular saddles were out of diecast. With this tremolo, the tone was rounder, softer and with a more pearly attack. The number of pickup-windings was reduced from 8000 to 7600, which caused a slightly more brilliant tone. Ritchie stayed with this tremolo construction. All his future Strats were fitted with the 70s tremolo. Furthermore the three bolt neck, bullet truss rod and big CBS-headstock were featured on most of his guitars until nowadays. Therefore the Stratocaster of the 70s era became Ritchie’s trademark. Compared to the new 72 the old 68 Strat had more Sustain, fatter sound and more punch. The new one had an overall airy, slender and sportive sound. In the following months the 68 was rarely used, only if Ritchie was in the mood of playing a show with a really fat and overdriven sound that particular evening, a discipline the old black one was more useful in than the new black 72. As usual the inevitable happened: the black 68 got smashed and was replaced by the 72. During summer/autumn 1972 Ritchie used the black one quite as often as the 71 sunburst, until it fell back to subs bench. The beginning of 1973 saw a new 72 sunburst Strat showing up. This one not only got the custom modified tremolo of the smashed 71 but a maple neck with an explicit scalloped and lacquered fretboard job. Ritchie played this guitar until the end of the DP Mk2 era, amongst others at the 1973 New York Hofstra University show. Midway 1973 the Strat had black knobs like those of a Fender Amp or a Gibson ES-345, surely being no Stratocaster knobs. One can identify the new 72 Strat easily because of the “bullet trussrod” on the headstock. The older 71 Strat still had the classic trussrod with the walnut-dot at the headstock. Another difference is the fretboard, the 71 Strat had a much darker one, because of the missing lacquer, showing all the dings and dongs from years of playing. As a backup for the 72 sunburst Ritchie used a late 72 natural ash body maple neck Strat also with a scalloped fretboard, which had been lacquered again after the procedure. During one of the last DP Mk2 shows Ritchie destroyed the fine 72 sunburst. From this day on, the end of DP Mk2 the beautiful natural ash Strat consequently became his main guitar for the next 3 years. For the last concert in Osaka on June, 29th, Ritchie used this natural ash body Fender Strat as a substitute and became his main guitar. More infos about Ritchies “plastic stripe guitars” in end of Mk2 and Mk3. 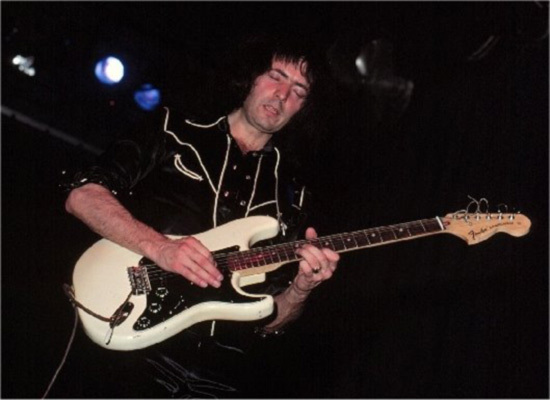 Ritchie Blackmore in the studio in November 73, recording the famous “BURN” album in the early Deep Purple Mk3 period and a pic at one of the last live shows of Deep Purple Mk3 in April 1975. He’s playing his heavy weighted late 1972 Fender natural ash body Stratocaster with scalloped fretboard, maple neck and original staggered Fender single coil pickups. This guitar had an extra fat U-shape neck, which was one of the reasons why it sounded so great. He really loved this guitar, and it was his main axe during the complete Deep Purple Mk3 period and the early Rainbow days. 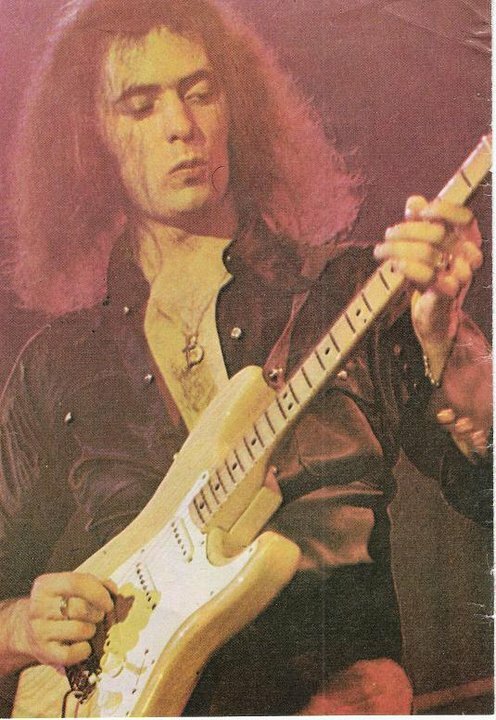 After this guitar was stolen out of Ritchie’s house, he only played one last 70´s “big head” Fender Strat with a scalloped maple fretboard before he switched to rosewood fretboards during his Rainbow days and for the rest of his career. 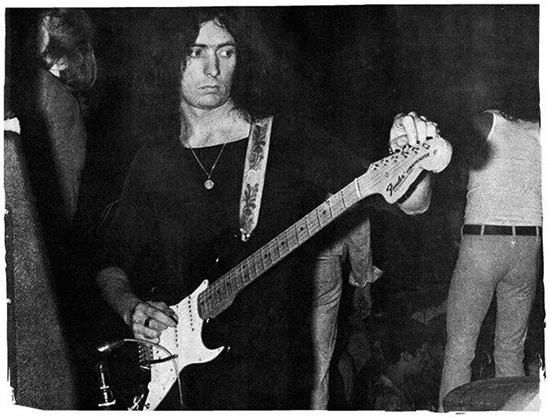 His main backup guitar became the black 72 maple neck Strat. 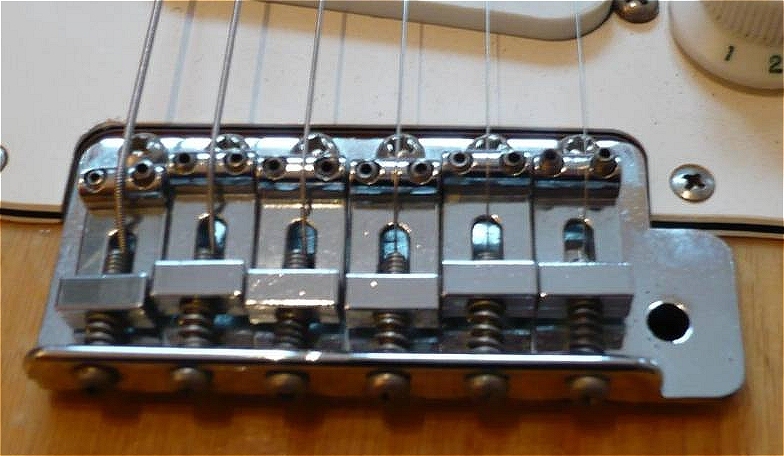 Ritchie really liked the one-piece diecast inertia bar with the diecast saddles, commonly found on all 70’s Strats. He never liked the earlier vintage saddles out of metal too much. He also preferred the original staggered Fender singlecoil pickups of the early 70’s with the bright and biting sound. 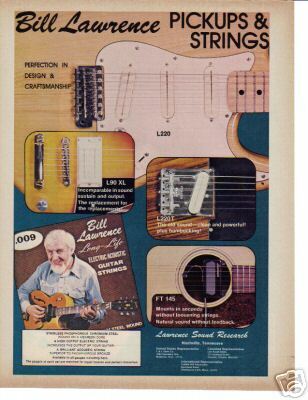 In spring 1974 Fender introduced the more cost effective non-staggered (aka “flat pole”) pickups, that Ritchie never liked. 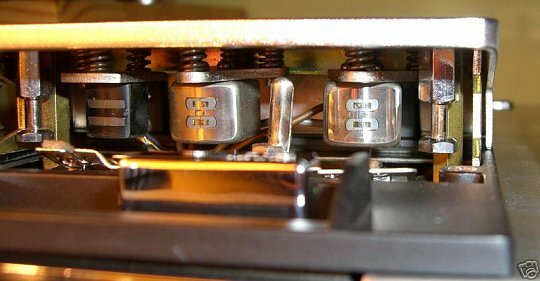 A perfect substitute for these early 70´s Strat pickups are the Fender Custom Shop “’69s” pickups (aka “Abigail Ybarra pickups”) and theLeoSounds “VPS Fireball” pickups - you can see a pic of the LeoSounds pickups here. With the overwound pickups of today, it’s not possible to nail Ritchie’s pre 1977 tone! During the “Burn” Session Ritchie became very creative with his gear and used everything he liked. 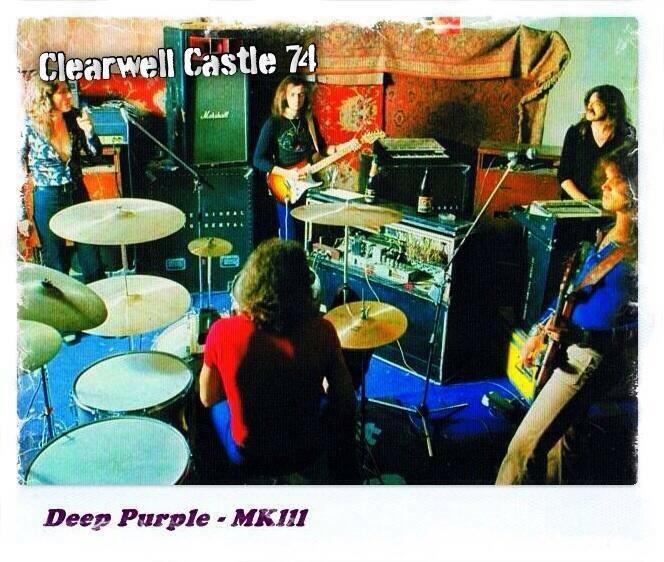 Now he was without restrictions the leader from Deep Purple Mk3 and could experiment with whatever he wanted. Besides his trebleboosters Ritchie used different amps, even a small car-battery powered transistor amp (“Sail Away”) out of the recording studios junk room. 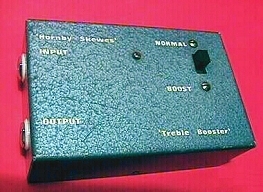 Furthermore the EMS Hi-Fli (an early guitar synthesizer on “Sail away”, contains such effects like treble booster, fuzz, octave fuzz, sustain fuzz, vibrato, phasing, chorus, standard & special wah-wah (eg. 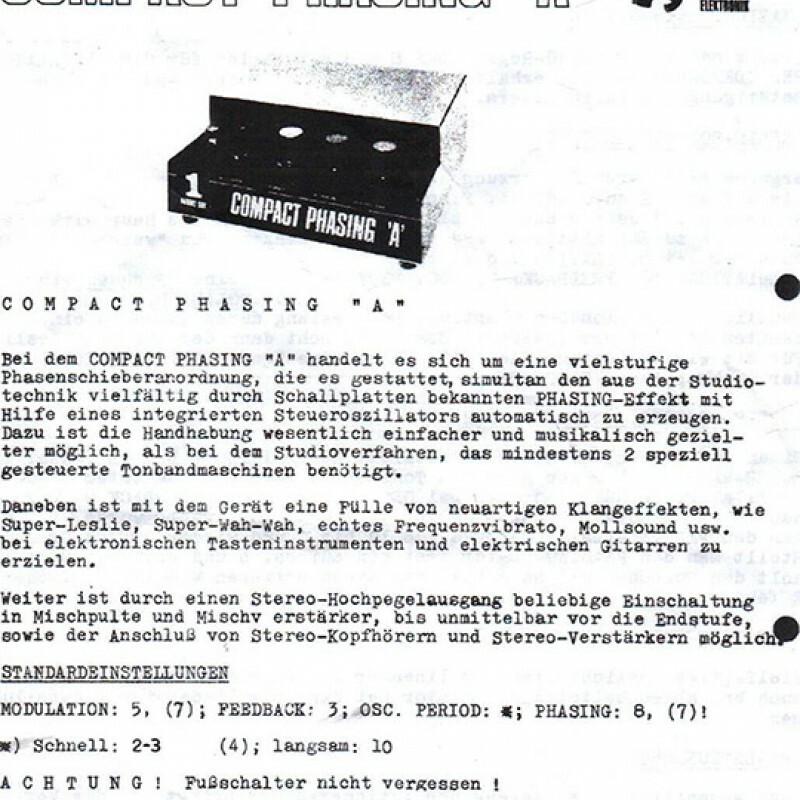 with six resonant peaks), ring-modulator, and other features) and especially the German Schulte Compact Phaser “A” came into operation. 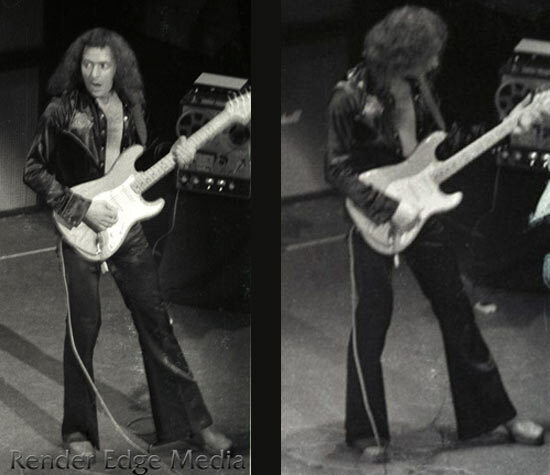 For DP Mk3 live concerts Ritchie used his natural ash body Strat nearly exclusively. 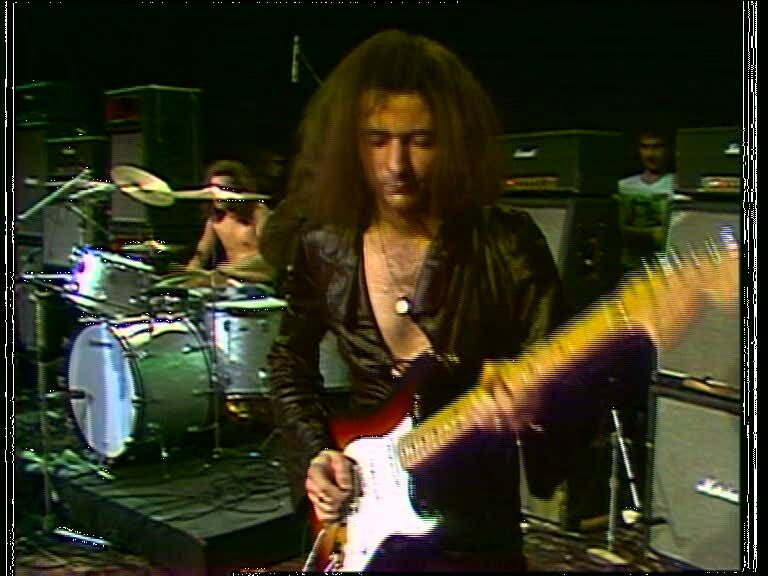 The black 72 served as his backup guitar, which Ritchie already used mid/end 1972 with DP Mk2. Now it had a lacquered scalloped maple fretboard as well and occasionally metal dome speed knobs like those of a Telecaster. This black Strat from late DP_Mk2 era was destroyed by RB in early ´74 during an excessive showcase. The follow backup guitar was a new 74´s sunburst maple neck scalloped model with staggered Fender pickups. 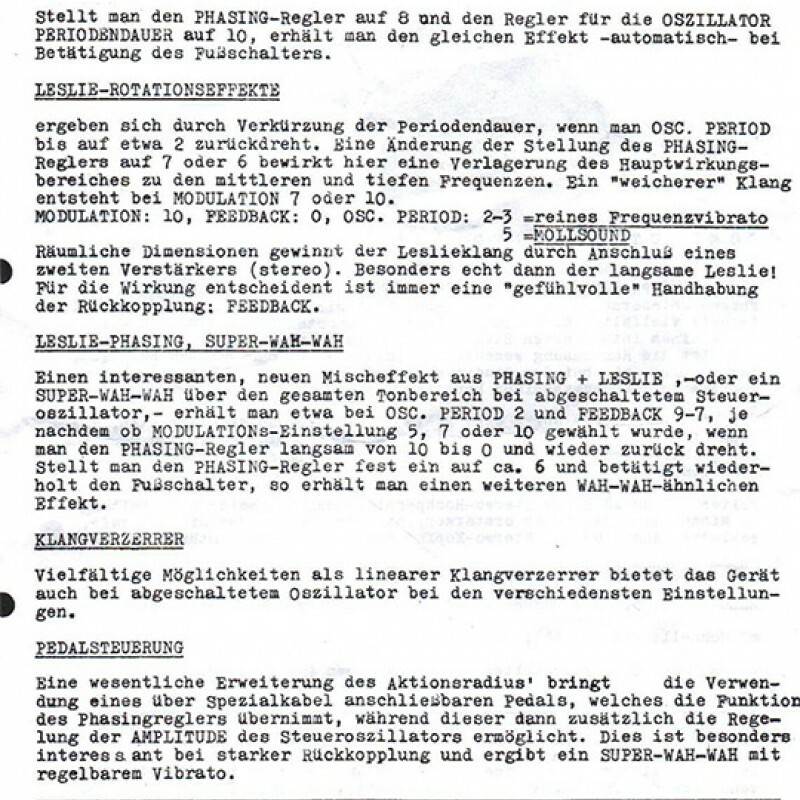 This Strat was also used as second guitar beside the natural ash body by rehearsal in July ´74 for the “Stormbringer” material (recorded during Aug ´74 at Musicland studios Munich, released in Nov ´74) and later also for a short time in early Rainbow era – see “Rainbow” chapter. Note, this 74s sunburst Strat was not fitted with the stock pickguard and pickups, it was modded by Ritchie, loaded now with the old pickguard from the destroyed ´71s “Machine Head” Strat. Ritchie in April 1974 at Ontario speedway / California jam From December 1973, at the beginning of the “Burn”-Tour in Northern Europe, Ritchie used a partly new live setup: the preamp of his Marshall Major amps were now modified, the treble boosters were retired and replaced with his famous AIWA TP-1011 reel-to-reel recorder, built in December 1970 both as a booster and a delay effect. 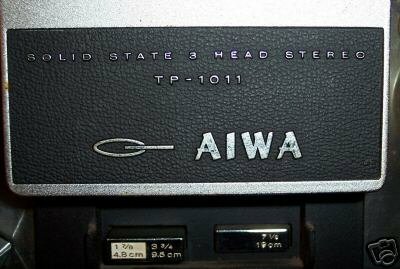 For his studio work Ritchie also started to use the AIWA machine as a booster accompanied by lots of other gear, including his treble boosters. A few years later in his Rainbow days he began to use it regularly. 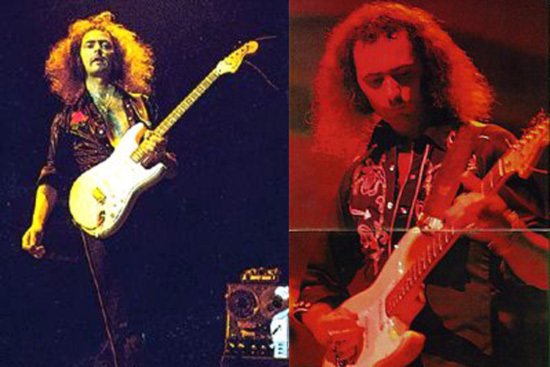 In the beginning of Rainbow´s live activities in November 1975 Ritchie used for a short time the 72 natural ash as master guitar, than he used alongside a 74 sunburst maple Strat with scalloped and lacquered maple neck. Except for the scalloping the 74 Strat was a stock model, concerning the Tremolo, pickups and tuners. Ritchie mainly recorded the 1976 “Rising” album with this guitar. Early 1976 the 72 natural ashbody Strat was slowly replaced by the 74 sunburst on stage, but was used sporadically until summer 1976. First of all used as a backup guitar but soon became the second main axe was a Strat in olympic-white with an alder body, built in 1974 as well. This one was Ritchie’s first with a scalloped rosewood fretboard (see next chapter). Midways 1976 the sunburst was Ritchie’s master guitar during the “Rainbow Rising” tour, only to be replaced step by step by the white 74 one. He then used the sunburst as backup for some time. 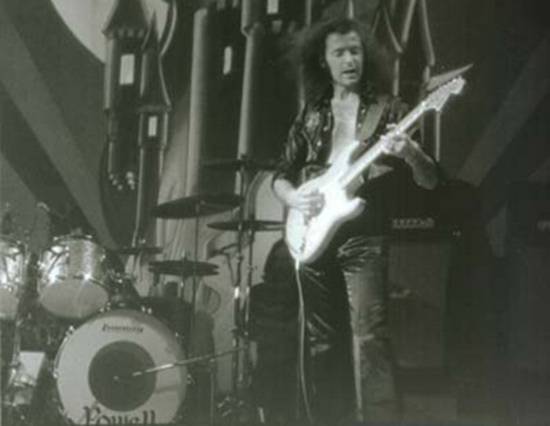 A late 1976 pic from Ritchie on stage with RAINBOW. He is playing his famous Olympic white ´74 Strat with the original, staggered Fender singlecoil pickups. Ritchie wrote history with this white 74 Stratocaster (Serial Number: 578265). Like it was mentioned before, this was his first Strat with a scalloped rosewood fretboard. He favoured rosewood from this point on for all of his main guitars. The era of lacquered and scalloped maple necks was expired. After all a rosewood fretboard is by far easier to scallop and needs no re-lacquering afterwards. Compared to the bright sounding lacquered maple fretboard, rosewood sounds warmer with a fuller midrange tone. Autumn 1976 saw the first use of that guitar. Tremolo was stock. For the first time ever tuners were replaced with the superior Schallers. From now on all of Ritchie’s Strats featured Schaller or later staggered Sperzel types. This was also the last guitar to feature stock Fender pickups. It was used live until midways 1977, and then disappeared for about 2 years only to revive with new pickups. 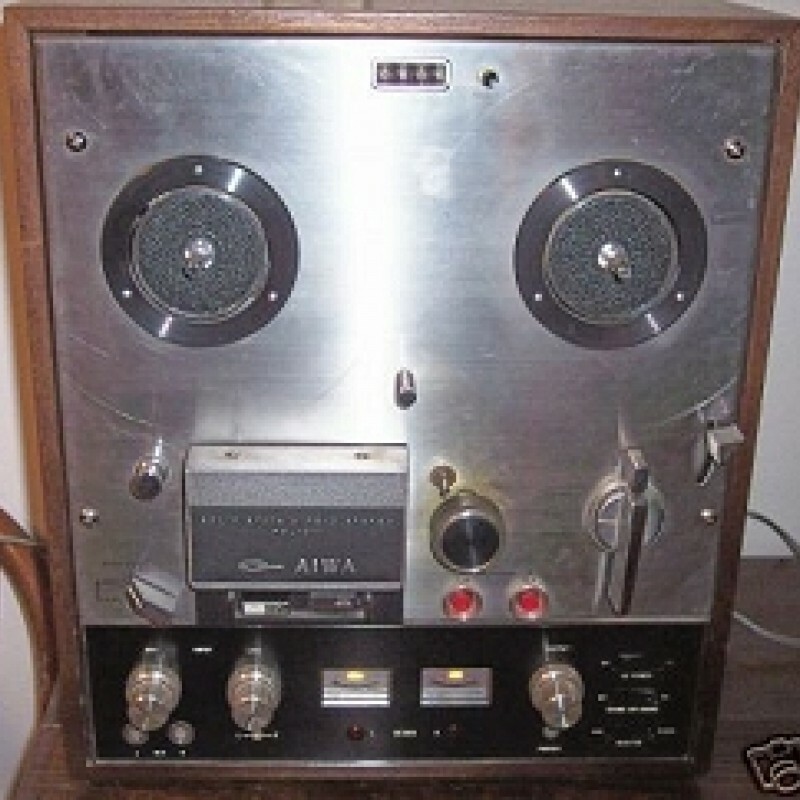 In the background you can see the AIWA tape recorder, with the german Schulte "Compact Phasing A" phaser on top. 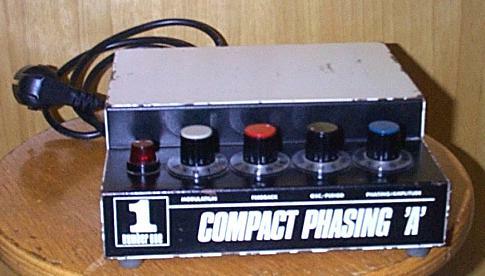 This was an 8-stage phaser built in Berlin/Germany, similar to the 6-stage MuTron phaser. You can hear this unit on “Catch the Rainbow”. Another excellent example for the use of this phaser, is the 1974 “Autobahn” album from the German band “Kraftwerk” .py, the first German band ever who was able to place a record in the US charts - it was exactly this album! Another excellent example is the 1977 “Mirage” album from German avant-garde synthesizer player Klaus Schulze. 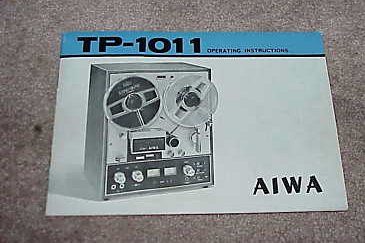 The AIWA TP-1011 tape recorder was Ritchie’s echo and booster machine from December 1973 (start of the “Burn” tour) until 1992. 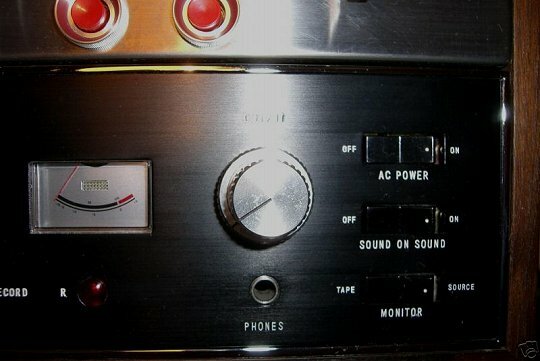 At this time, the AIWA partly went bad, and was only used as a booster, while a warm and mild sounding 19” rack-mounted Yamaha digital delay was used for the echo and delay effects. 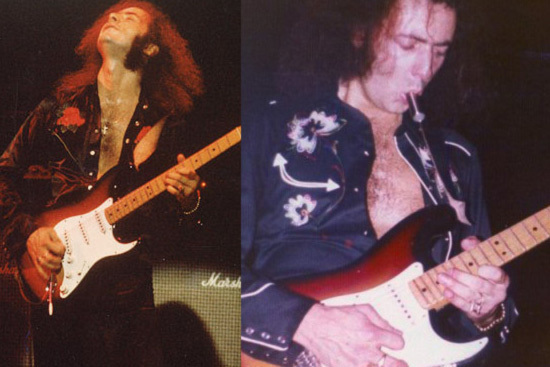 Ritchie Blackmore in mid/late 1977 with his famous 1974 sunburst Fender Stratocaster (Serial number: 576183) with scalloped rosewood fretboard and staggered singlecoil pickups. This was one of his favorite axes with a real killer tone and Ritchie’s master guitar during the “Long live Rock´n´Roll” period. One of the reasons why this guitar sounded so good was the extra fat neck profile. He also played this guitar on the legendary “Rockpalast” concert on the 20.10.1977, produced and broadcasted from the “Olympiahalle” in Munich/Germany. 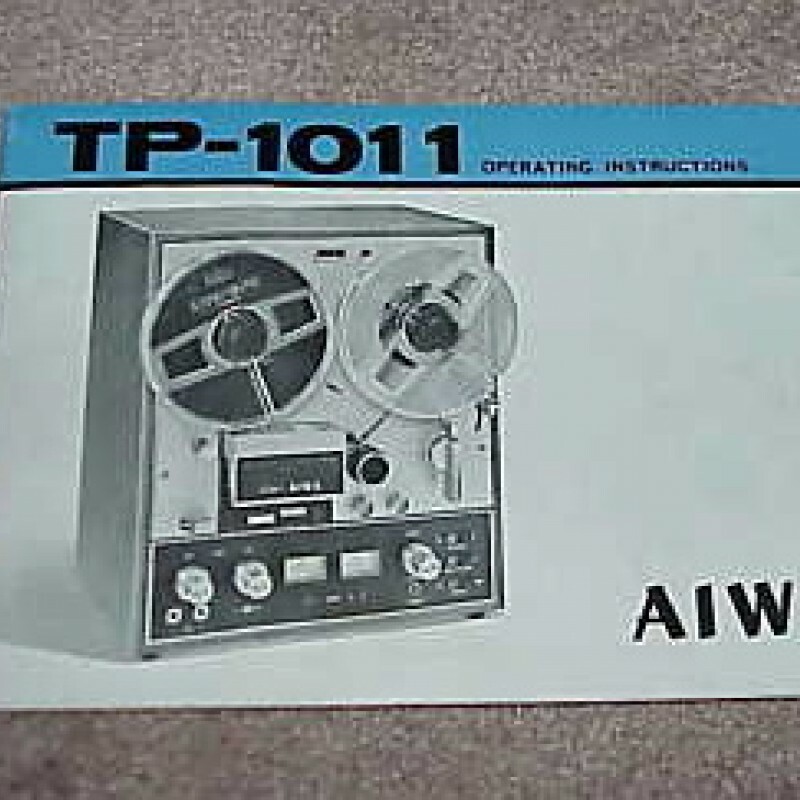 In the background you can see the AIWA tape recorder, this time without the Schulte Phaser on top. This was the first Stratocaster that Ritchie’s former guitar tech took care of. 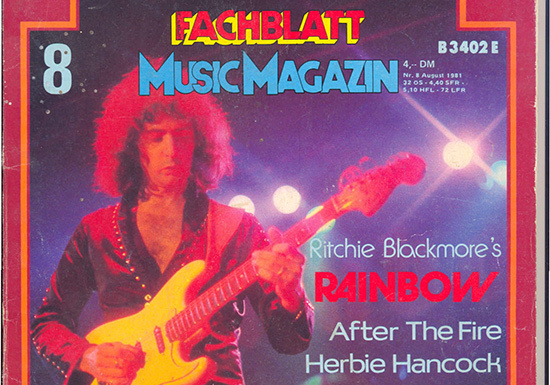 At this time, Rainbow used a huge rainbow on stage, equipped with more than 4.000 light bulbs which caused a lot of humming noises in Ritchie’s stock singlecoil pickups. 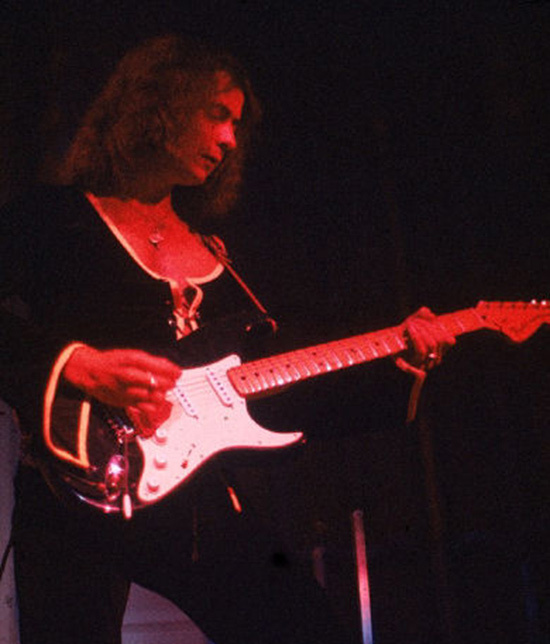 The amount of hum and noise was so annoying, that Ritchie had problems to concentrate on his difficult solo parts, thus wanted to get rid of this problem. First Ritchie´s tech tried to shield the pickup routings of the Stratocaster with different materials to solve this problem, but the success was minimal. As a result he decided to modify the stock Fender staggered singlecoil pickups, by overwounding them. He decided to only overwound them slightly. He put an additional 1000 ohms on the Fender neck pickups, a little bit more on the lead pickup. 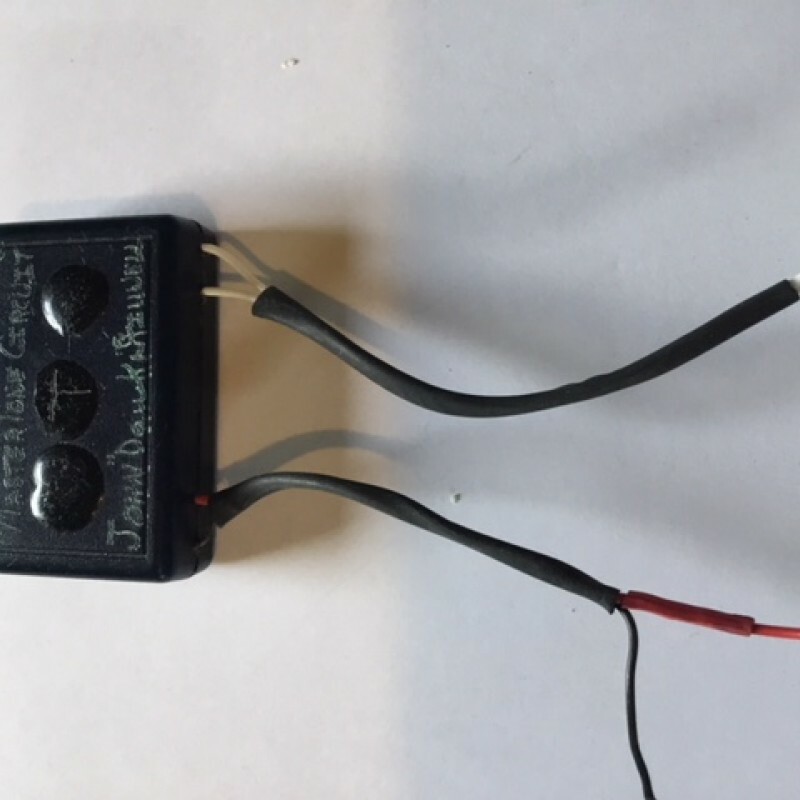 Finally the neck pickup has had 6.6kOhms DC resistance. When rolling back the volume pot you will have an often-unwanted effect. Especially with overwound pickups one gets lost of the treble and receives a dull sound. So as to retain the crisp sound when rolling back the volume pot Ritchie´s tech installed a “treble bleed” capacitor into this guitar. At the same time the stock 250k volume pot was replaced with a 300k type. 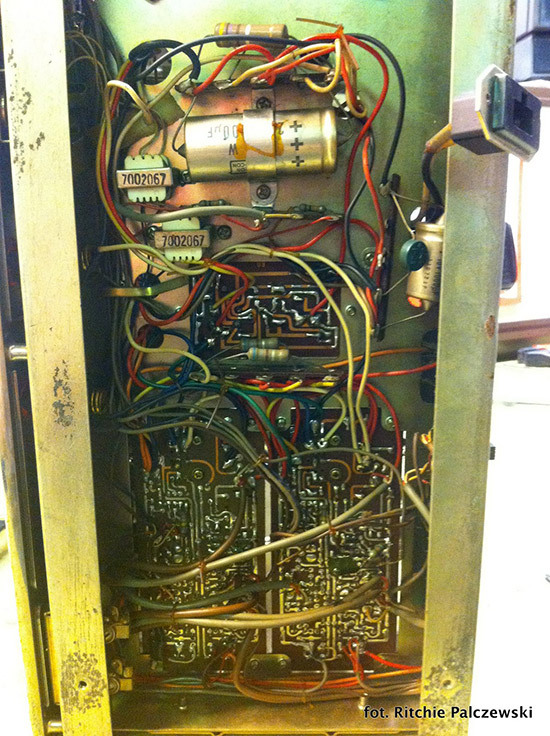 Later on, probably in the early 80´s, the stock 250k tone pot was replaced with a 300k type as well. Especially on the “Rockpalast show”, it´s easy to hear this additional glassy-brilliant amount of treble, if Ritchie reduce the guitar´s volume. Blackmore used this guitar until mid 1978 as his main axe. His retired 1974 sunburst Strat was used now from time to time for some “old sounding” songs. In 1980 Ritchie beheaded this axe in a wild fit of rage. 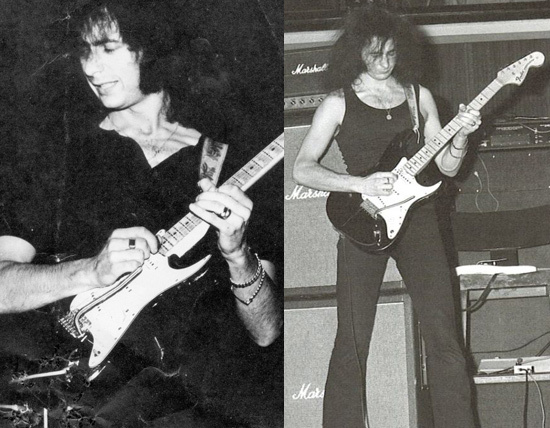 In mid 1978 Ritchie started to use his first hum cancelling Stratocaster (1977er Olympic-white, Serial number: S778960), designed and built by his tech. Ritchie also wanted a more modern sound, and finally he choose the “Velvet Hammer” pickups from Red Rhodes, high quality overwound Fender style pickups. 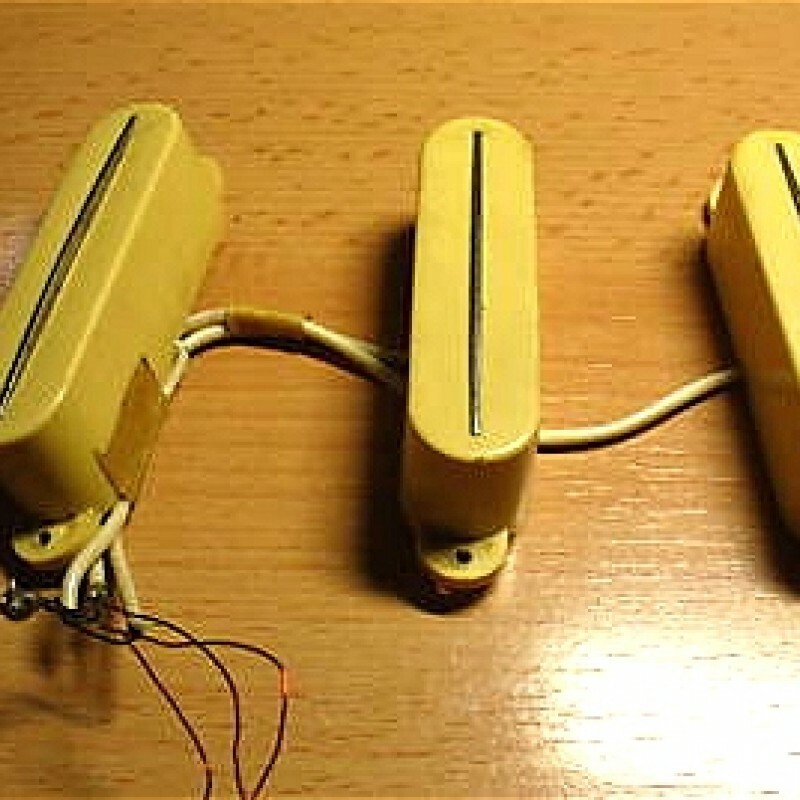 The slightly increased output of these pickups was not the main reason for Ritchie’s choice, because the preamp stage of his AIWA still had plenty of gain. 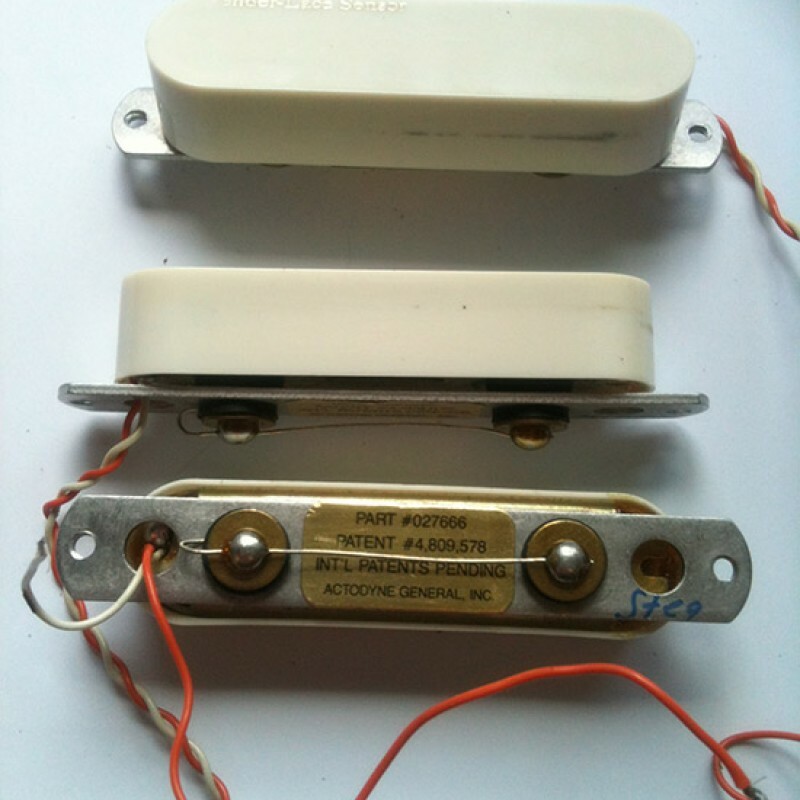 In the middle position of the pickguard, Ritchie´s tech installed a dummy coil construction, so together with the bridge or neck pickup, Ritchie received a humbucking effect. 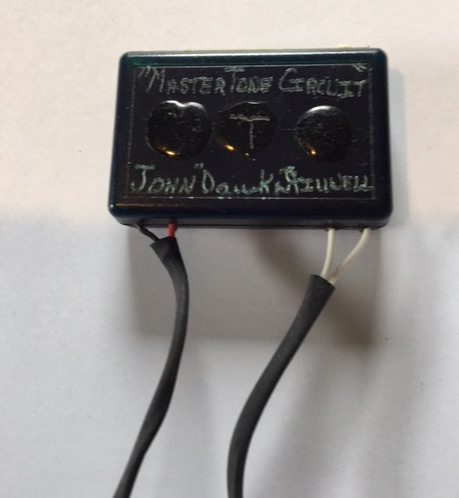 The dummy coil was a demagnetisized pickup. Furthermore this axe was probably the first of his guitars equipped with his techs so called Master-Tone-Circuit (MTC) with which Ritchie was able to get a creamier lead tone, if he wanted to. All of Ritchie’s following Strats will have the MTC build in. This Strat was used with a stock black pickguard from 1978 during the last months with Ronnie James Dio as lead singer, over the complete time with Graham Bonnet up to the early days with Joe Lynn Turner on vocals. 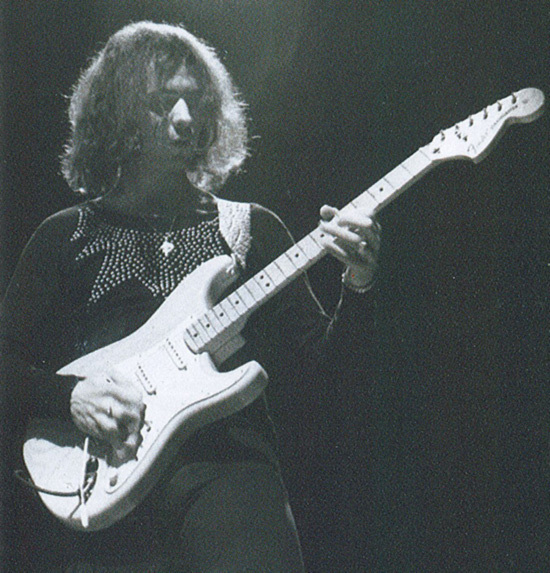 At the beginning of 1981 Ritchie swapped the black for a white pickguard on this ‘77 Strat. 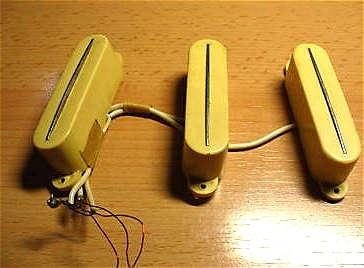 By the way, a good substitute for the “Velvet Hammer” pickups are the socalled hot Fender “X-1” pickups which used to be put into the treble position of the Fender Strats around 1980 as overwound versions of the bridge pickup. The Fender “Lead II” guitar was sporting the same pickups as well. Ritchie tried the X-1 pickups as well, but decided to stay with the Red Rhodes. A further substitute for the “Velvet Hammer” would be the “Munich ‘77”, available as custom order from Leosounds. 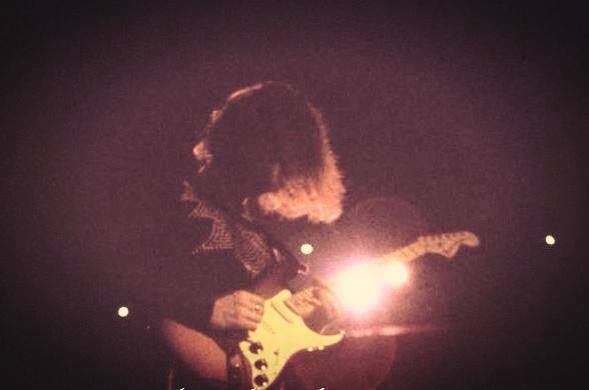 In fact this Strat changed electrics a couple of times but followed Ritchie into the 3rd Millennium. 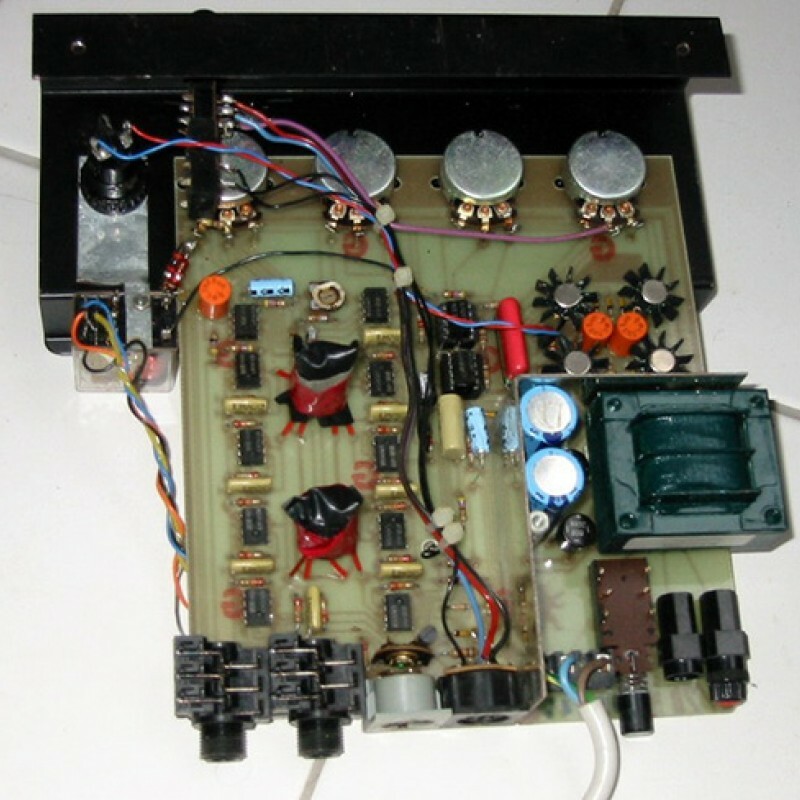 In 1990 the axe gets a Roland GK-1 guitar synthesizer build in, the Velvet Hammer pickups stayed until 1995. The bridge and neck position were swapped for white Lace sensor “Gold”, which were recoated black. 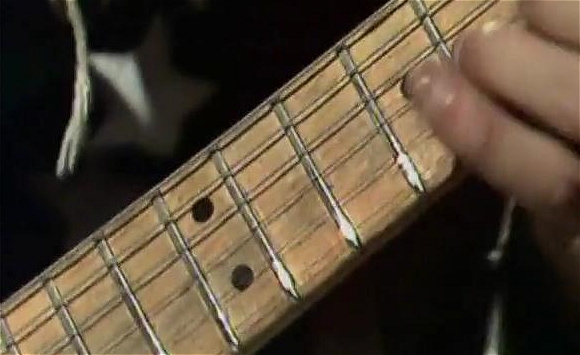 In 1999 the guitar got white Lace Sensors and white knobs. This guitar is still in stage use with Blackmore’s Night fitted with a Roland GK-2 guitar synth, but back to chronology. In late 1979 a new guitar showed up more and more on stage in parallel to the black pickguarded one, and becoming Ritchie's trademark axe. At the end of 1979 Ritchie´s tech showed a new pickup to him, the uncommon Schecter F500T, and Ritchie loved it right from the start. 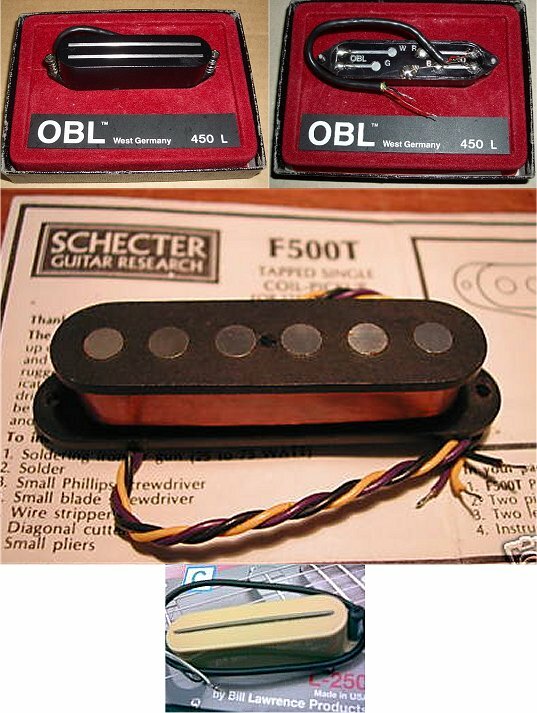 For a Strat style pickup, the Schecter had very fat 1/4" (approx. 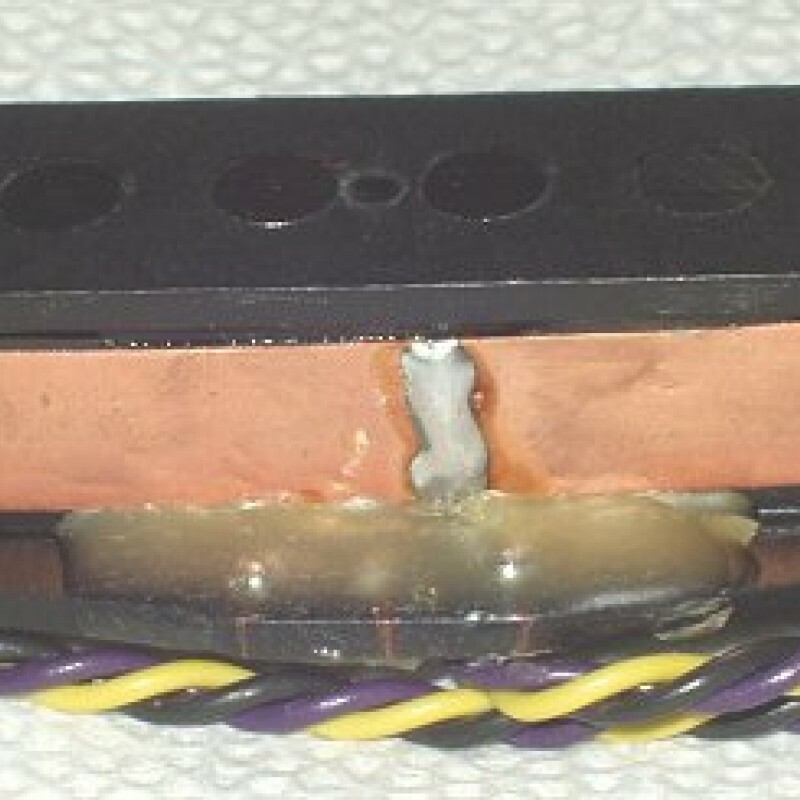 6.3 mm) cylinder magnets and a tapped coil (coil was wound with AWG 43 wire instead of the AWG 42 by Fender) to switch between a classical fenderish singlecoil tone with slightly increased output or high output. Because of the fat magnets, the tone gets very meaty with a punchy bass, something that Ritchie really liked at this time, because he wanted to get rid of the typical thin bass response of a Stratocaster, but still keeping the characteristical transparent singlecoil tone that Ritchie loved so much. 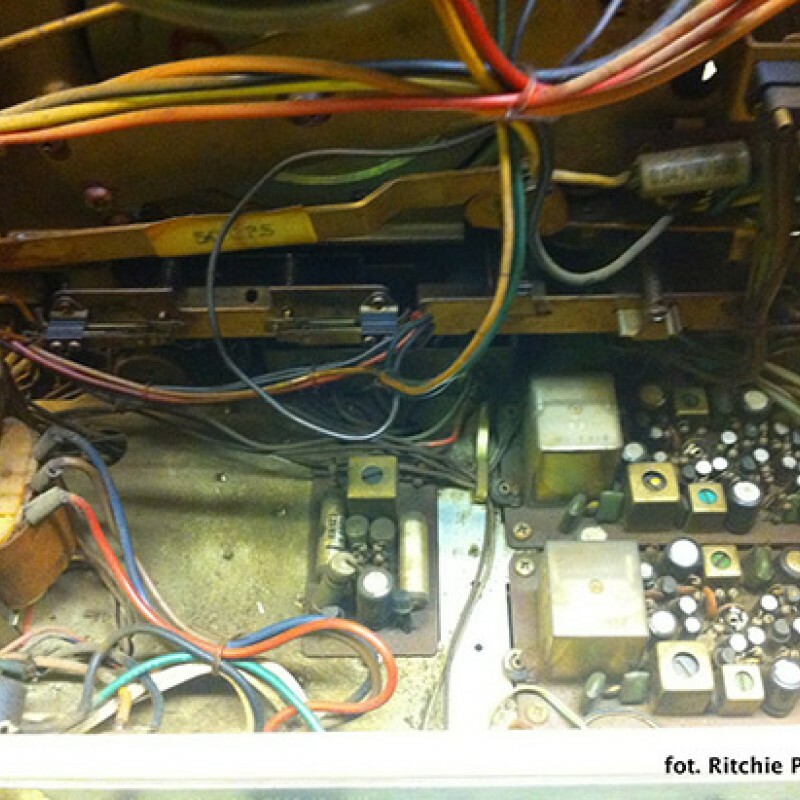 Ritchie´s tech did not wire the Schecter pickups for full output. Instead he wired them for a tapped, low output but with his own genius behind it. 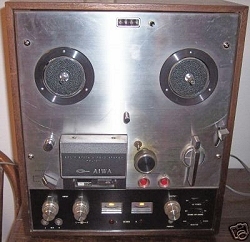 Ritchie still received his necessary gain from his AIWA tape recorder. 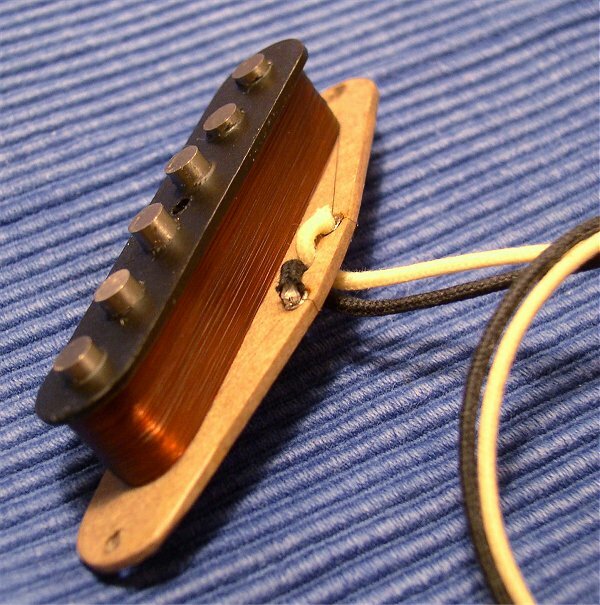 Blackmore´s tech only connected the inner half of the lead pickup’s coil and the outer half of the neck pickup’s coil to receive additional bass response - a very tricky but effective wiring! 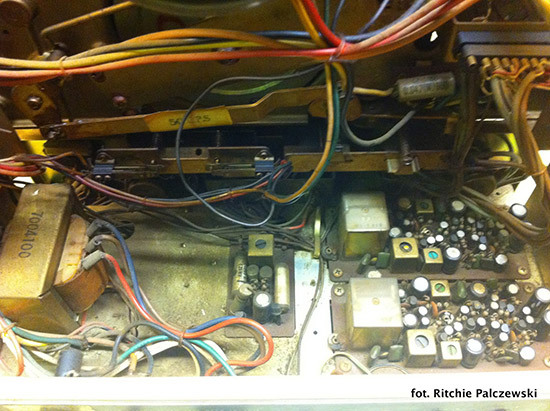 He still used a dummy coil in the center position and his MTC wiring (see above). The colors of this Stratocaster became Ritchie’s trademark: a white “big headed” Stratocaster, a maple neck with a scalloped rosewood fingerboard, a white (or greenish) pickguard with black pickup covers and also black knobs, switch and tremolo-arm tips. The white Strat he used the black F500T pickups in was no other than the old 1974 Olympic-white one. 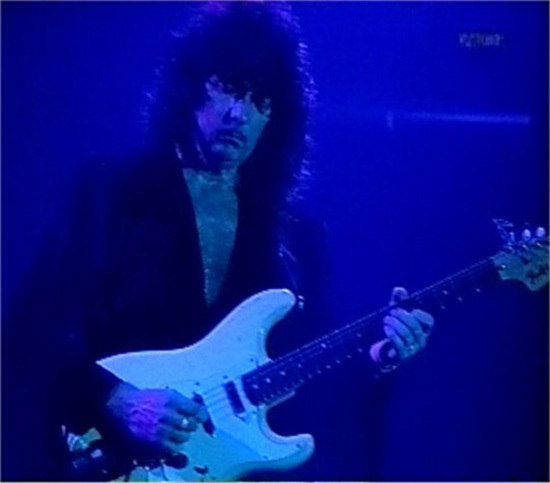 The upgraded guitar showed up on stage in late 1979 and was used side by side with the 77er black pickguarded “Velvet Hammer” Strat in 1980, which became Ritchie’s favourite axe. 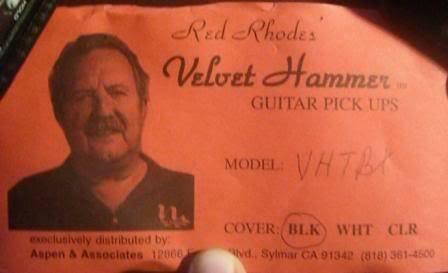 The Velvet Hammer Strat stayed his second main axe for many years. Later his main guitar got “destroyed” during seeing service. Ritchie told the story that he gave it away for re-fretting and got it back with the words: “By the way, no extra charge but I plained the fretboard for you!” What actually meant that he plained the scalloping flat, because the guitar service man thought it was from overplaying. Ritchie got berserk and tried to re-scallop it, only to find that the fretboard was to thin now for scalloping, the maple of the neck came through. The neck itself got very thin afterwards and Ritchie sent it into retirement only to use the second main guitar as his favourite now. Ritchie still had his problems with the F500T Stratocaster, because a pickup installed at the neck position is always a tad louder than a pickup in the bridge position. Ritchie really loved the warm full tone of his neck pickup, but the bridge pickup was too thin and punchless for the fat lead-sound he had in mind. 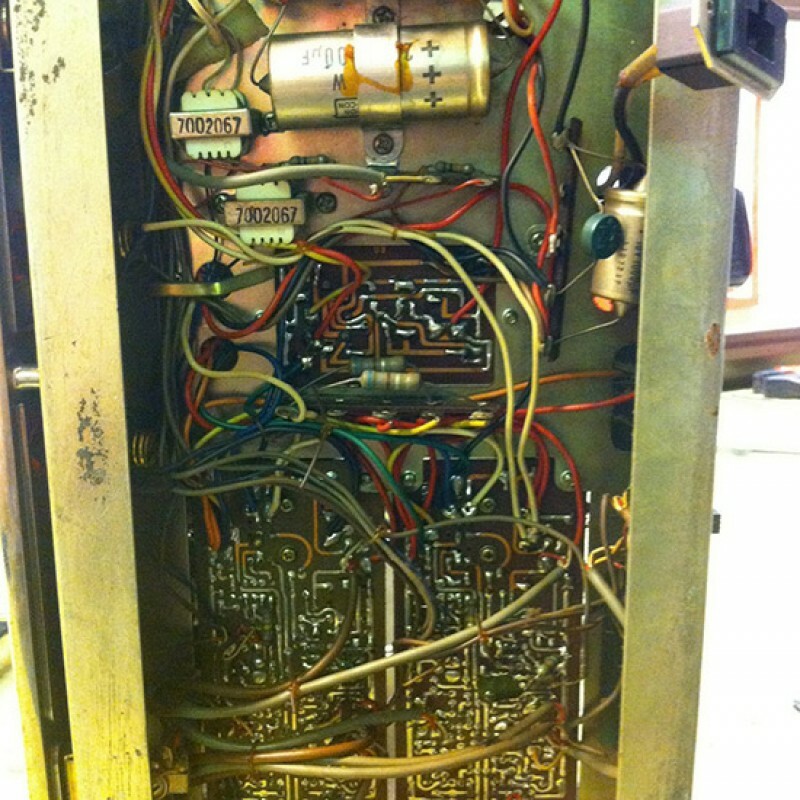 To solve this problem, the F500T pickup was soldered for full gain after a short time. 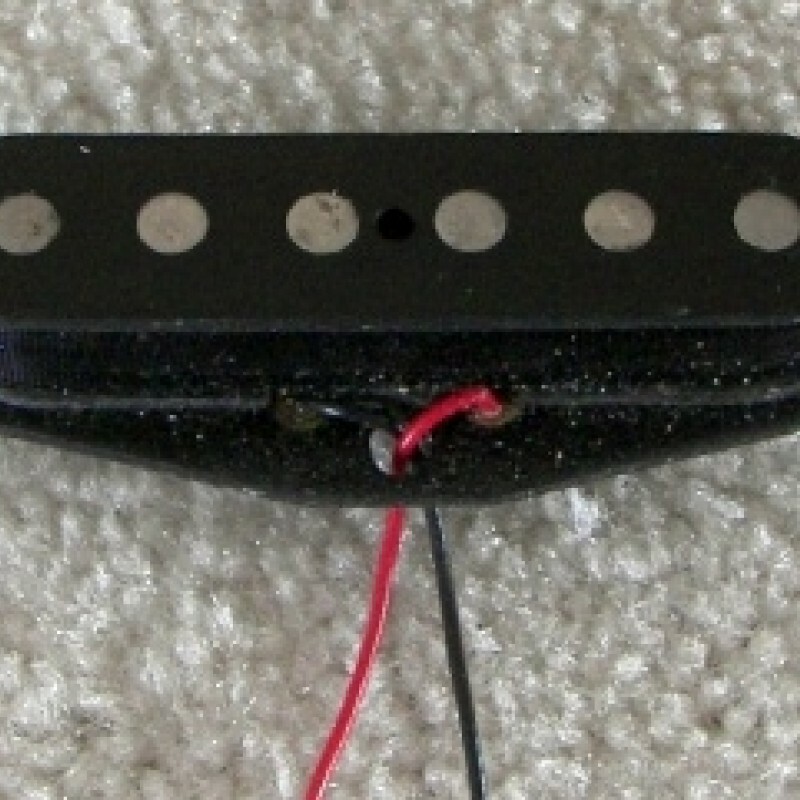 To prevent the pickup from getting louder as intended, it was lowered to increase its distance from the strings (see pic). Ritchie was very glad about the sound of this Strat now, but this procedure also created an unwanted side-effect. For perfect hum bucking, both coils have to be as close as possible plus they should have the same number of windings! 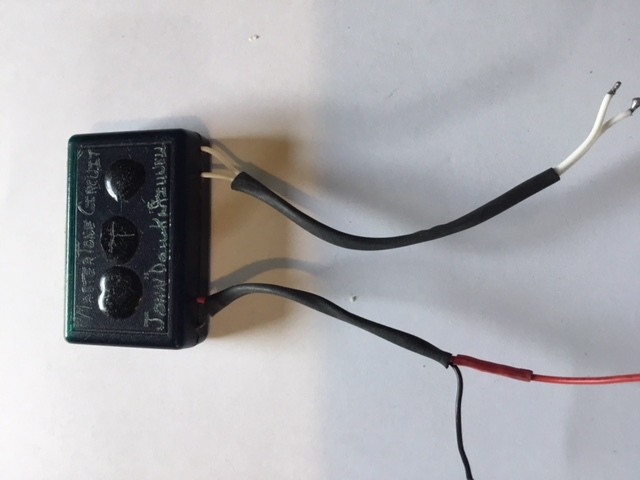 The dummy-coil was developed and balanced for the neck pickup (and of course for the bridge pickup before this procedure), but it was too weak now for the bridge pickup with full gain ... it was simply underwound. Furthermore, when combining a pickup with a dummy-coil, the inductance of both is added to each other, which means a noticeable treble loss. 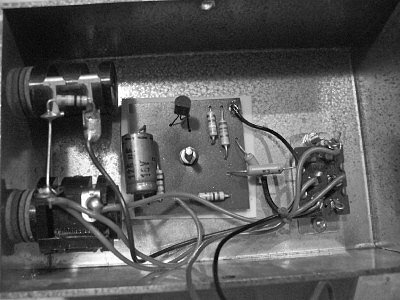 The neck pickup together with the dummy-coil sounded awesome and was almost hum-free, but using a fatter dummy-coil together with the bridge pickup was over the top, the sound was very dull, loosing all the top-end and bite, and Ritchie was unhappy again. 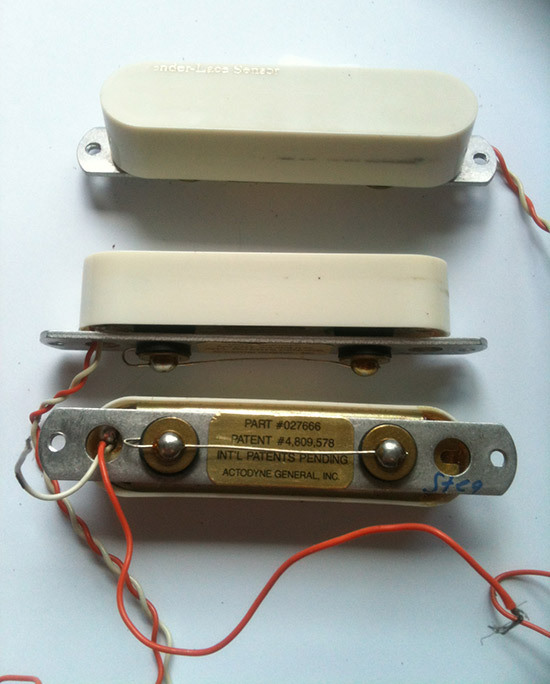 To get rid of the treble loss, the original dummy-coil for the neck pickup was used for the bridge pickup again. The top-end came back, but now the bridge pickup produced noticeably more hum than the neck pickup. Ritchie could live with that, but he was not very happy about it. For a short time, Ritchie used a modified modern 5-way pickup selector switch, to toggle between the bridge pickup’s full and half winding, but this did not last long, because Ritchie was used to simply flip the switch between the two outer positions, he did not like to mess around with the in-between positions of a 5-way switch. From now on, Ritchie and his tech tested a lot of new pickups, especially the new singlecoil-sized humbuckers. The first well working pickup of this new breed was the Bill Lawrence L-250 with approx. 12kOhm DC resistance. Bill Lawrence was and still is a tech-wiz, constructing the Gibson "Super Humbucker" (PAF style pickup with three ceramic magnets) in the 70´s and the genius Gibson L-6S Custom with "Multi Sound System" in 1972. These L-250's are single coil sized humbuckers, with a single blade instead of polepieces. The coils are wound vertically and placed on either side of the blade, not on top of each other. 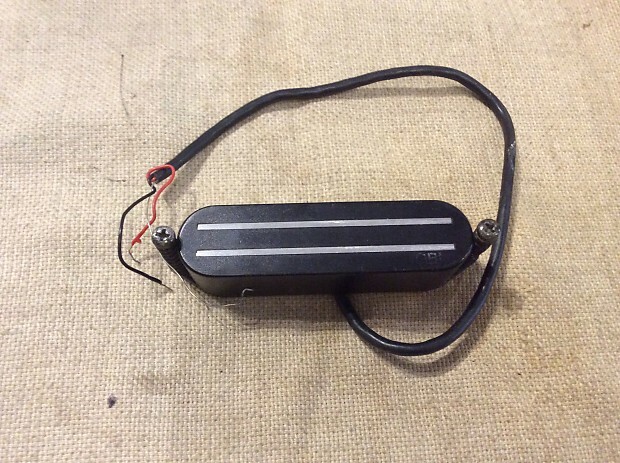 This was Ritchie’s first hum-free singlecoil-sized pickup, but Ritchie was not very pleased with the sound of the L-250, especially the neck pickup sounded very different compared to a real singlecoil. First and foremost this was because of the blade’s even magnet field underneath the strings, compared to the common six individual magnets and the resulting uneven magnet field, mostly in charge of the typical singlecoil sound. 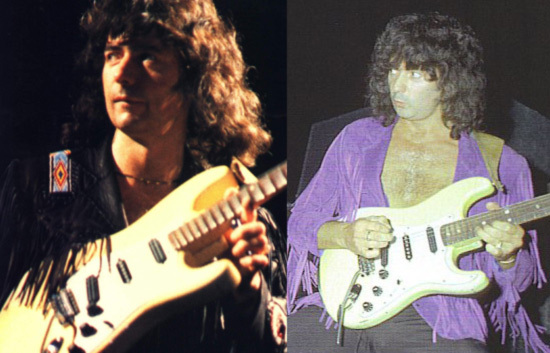 In spite of this problem, Blackmore´s tech modified a 1979s or 1980s Olympic-white Strat for Ritchie, equipped with a white pickguard and white pickup covers for the L-250 pickups, painted black after a short time to match Ritchie’s new guitar look. 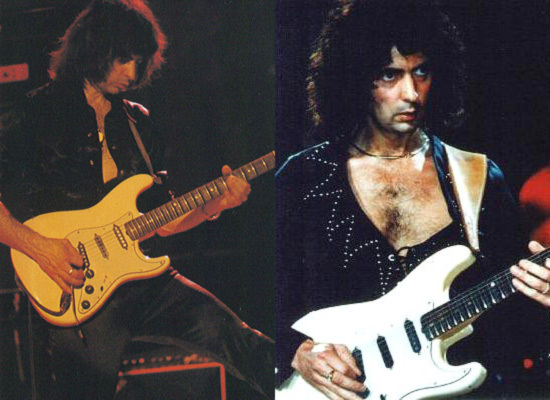 This L-250 Strat (alongside the F500T and the 77 Velvet Hammer Strats, the latter had a white pickguard now) was especially used in 1981 during the “Difficult to cure”-Tour. It had an extra long custom made Tremolo-arm. Only closer attention reveals another important difference compared to Ritchie’s other guitars. 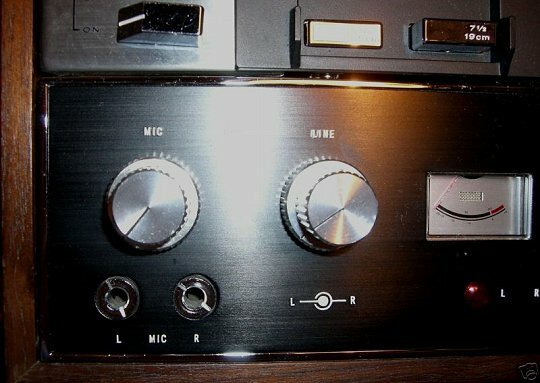 The L-250 did not have the common oval output jack-plate, but instead a slightly larger square black plate with the jack, a small hole and a mini-switch. 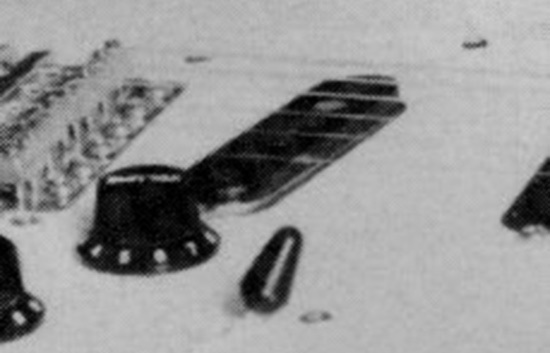 It was the then all-new Alembic Stratoblaster, a small 9 volts powered booster for a Stratocaster, having the electronics built inside the small space underneath the jack-plate and mounted on such a square plate, that can be seen on Ritchie’s L-250 guitar. No milling was necessary for installing. 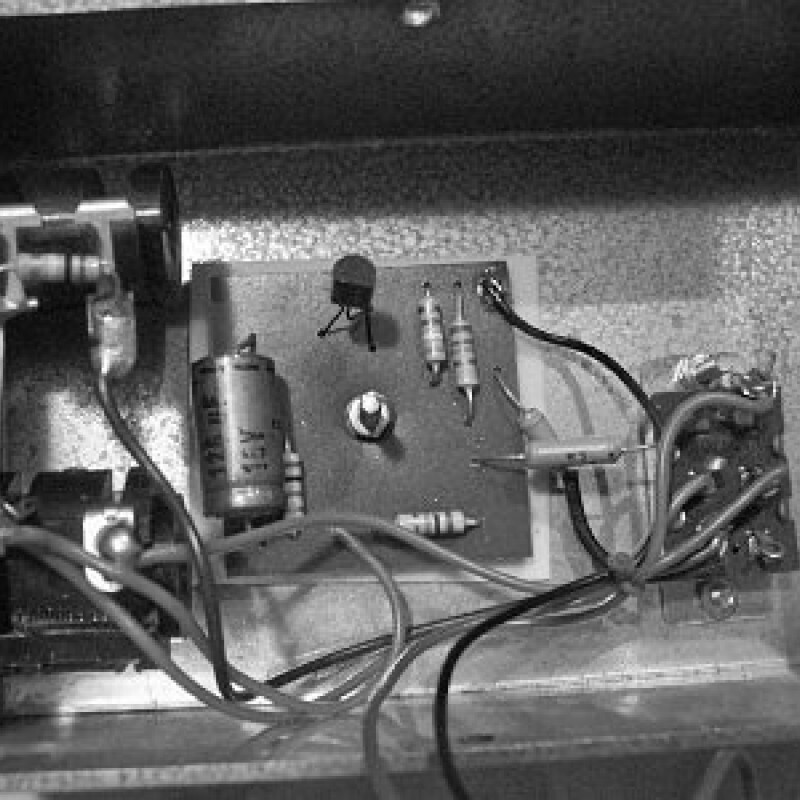 The 9 volts battery was placed underneath the tone control. The boosters’ gain could be adjusted in between 3 up to 14 dB by using a screwdriver inserted through the small hole on the plate. 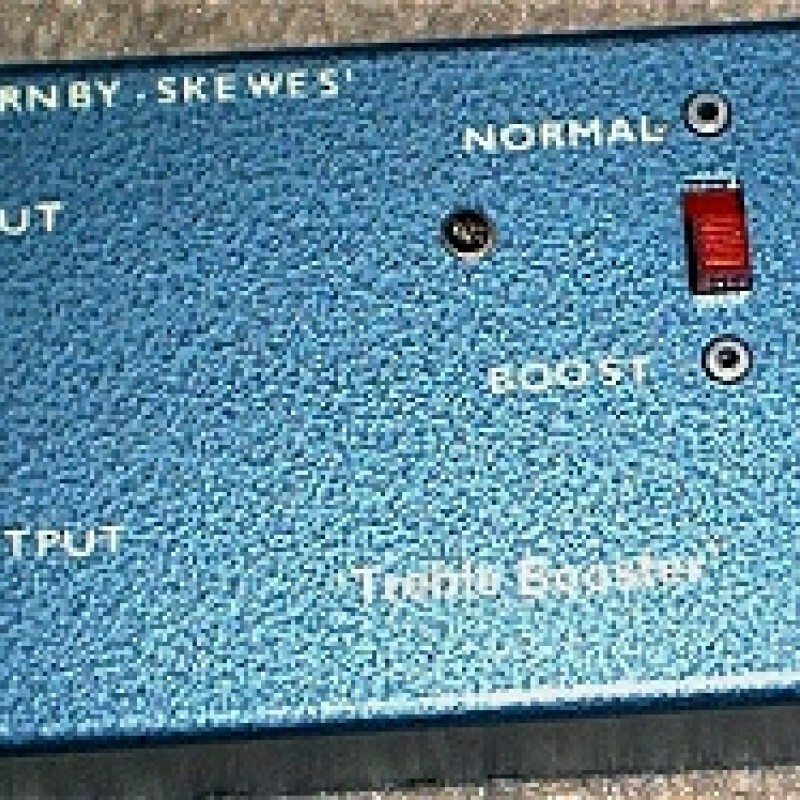 Using this booster had the effect that the pickups did not sound midrangy any longer but with more treble. The circuit could be bypassed with the small switch. 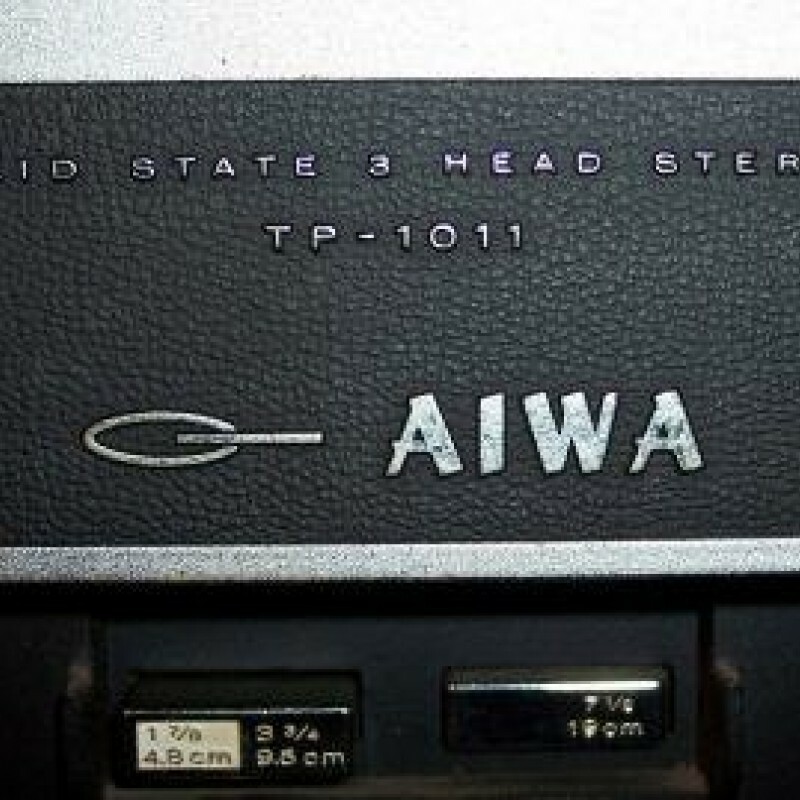 The amount of gain could not overdrive the AIWA’s preamp. 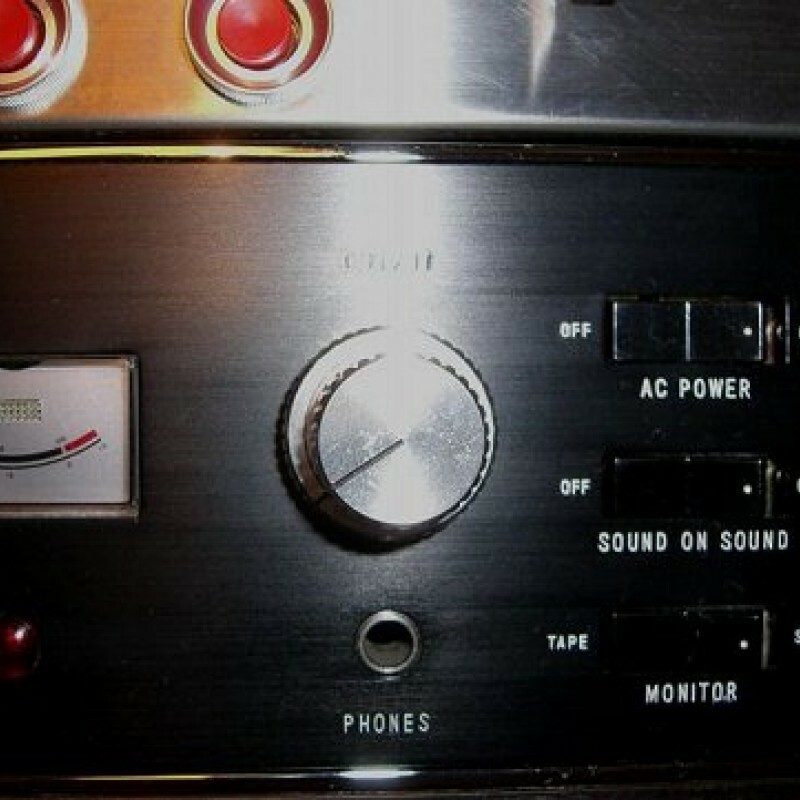 The L-250 remained Ritchie’s only guitar with active electronics. Nevertheless, the slightly humming F500T Strat still remained Ritchie’s favorite axe. We only want to shed some light on the important pickups Ritchie used, the short living models and the less important ones will remain unmentioned, because they never played any greater role for Ritchie. 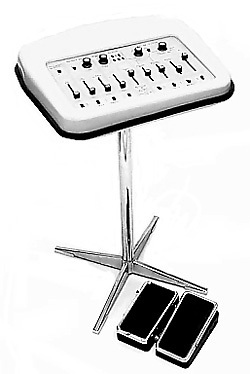 Same with the Roland GK-1, later GK-2 Synthesizer system, but it should be mentioned, that Ritchie played a minimum of at least two Strats, equipped with this system (one can here it e.g. on “Strange ways”). One of those was the 77 Strat, which became retrofitted from the Velvet Hammer to the new Lace Sensor pickups (late ´87/early ´88). The Velvet Hammers went to an 82 arctic-white Strat. 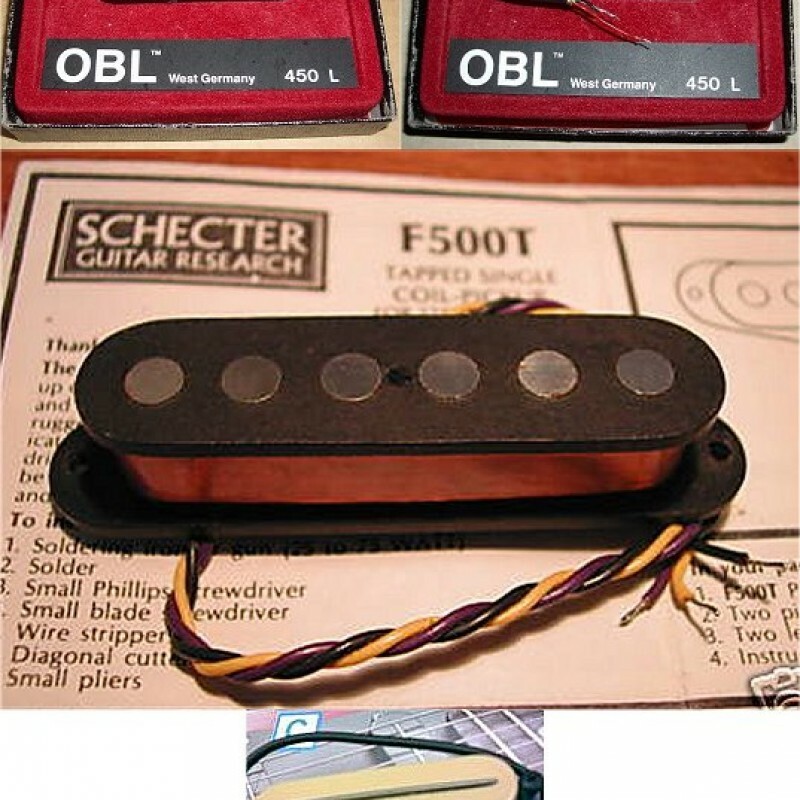 The final most important pickup for Ritchie was the new patented pickup model (US-Pat.# 4.809.578) from Don Lace who named it “Lace Sensor”. This pickup also showed up on regular Fender guitars like the Eric Clapton signature model. 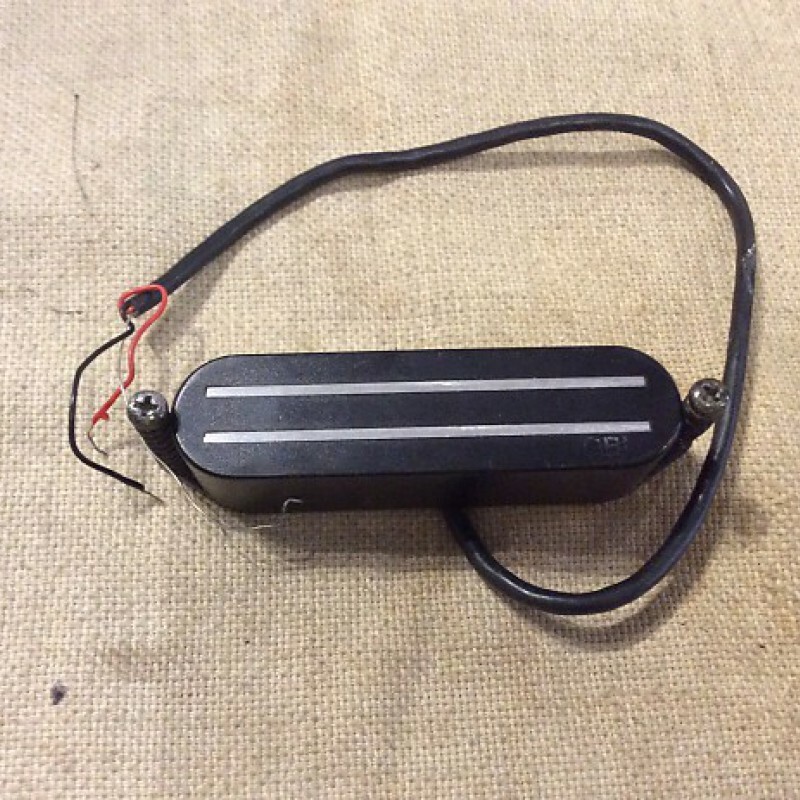 This pickup was a completely new constructed singlecoil, invented by Donald Lace in his “General Actodyn” company, designed for minimum hum and noise. 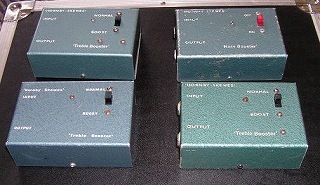 The pickup was available in several versions, categorized in colors by its output and sound. Ritchie played the “Gold” version, which was very similar in sound and output like the old Fender standard singlecoil Strat pickups from the 50s. With these pickups, Ritchie’s chase for the perfect pickup was finally over. From now on, he used his L-450 Strat only from time to time. After some internal trouble, Ritchie left Deep Purple again in November 1993, he reformed his own band, again under the name “Rainbow”. 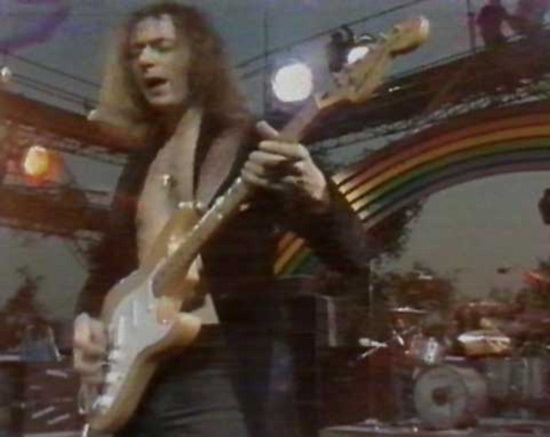 In this band, with a completely new crew compared to the original Rainbow band, Ritchie played first and foremost Stratocasters with Lace Sensors, some of them with an additional Roland GK-2 Synthesizer system. 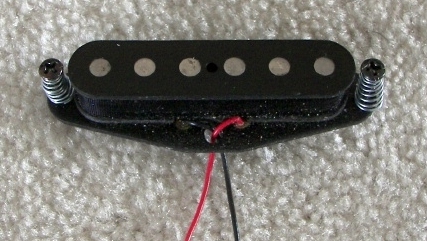 The Lace Sensor pickups had a white casing, but Ritchie painted them black. At this time it was obvious to see, that the black paint was partially scraped off from hitting the pickups with the plec, so later he only used the original white pickups without painting them black and also threw away all the rest of the black plastic parts on his pickguards, using completely white pickguards again. This became his new Stratocaster signature look until now. The only surviving guitar from former times was his L-450 equipped Strat. He still used his old and trusty AIWA, but because of mechanical problems in 1992 only as a booster. Since 1992 the typical Blackmore 2/3 sec. 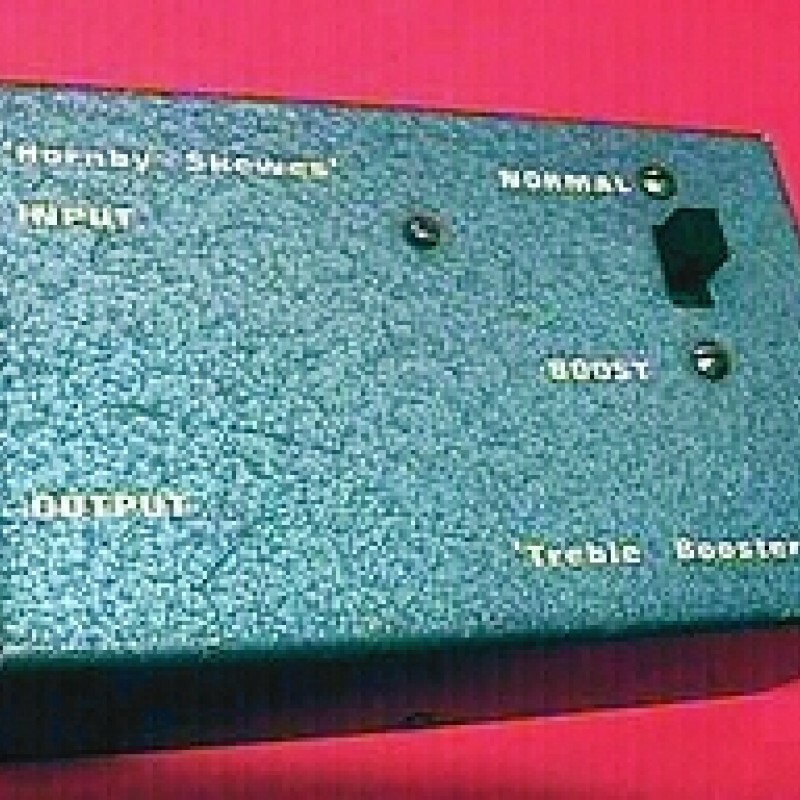 echo came from a big Yamaha digital delay. He used this 19" rack-mounted Yamaha delay for his last Deep Purple studio recordings (“The Battle rages on ...” from early 1993) as well as for the last live album “Come hell or high water” from late 1993 and on all his later recordings. Even in 2008 Ritchie used the AIWA as a booster for his live performances with “Blackmore’s Night”, but in the meantime the AIWA was placed backstage, because it looked really nasty without the tapes. Ritchie also retired his monster amps, the Marshall Major 200. In general Ritchie was still pleased with its tone, but for Ritchie’s new trademark sound, these amps were incredible loud. At lower volumes, the Marshall amps could not produce the typical Blackmore sound of this decade. Now that Ritchie crossed his 50´s, he wanted to get things more gently with Rainbow, and this was exactly something, that the Major amps could not do for him, without loosing the character of the tone. Ritchie decided to use an ENGL Savage 120 amp on the Rainbow stage, for smaller stages he used a 2x12” 50watt ENGL Sovereign combo amp. He also used it sometimes additionally on the Rainbow stage. Later with “Blackmore’s Night” he played the same combo, but with a 1x12” configuration. Here the 1995-setting from Ritchie’s Savage 120, whose 4 channels were distributed on 2 main channels A and B. Main channel A: clean/crunch 1, main channel B: crunch 2/lead. Ritchie used the crunch mode in channel A exclusively. 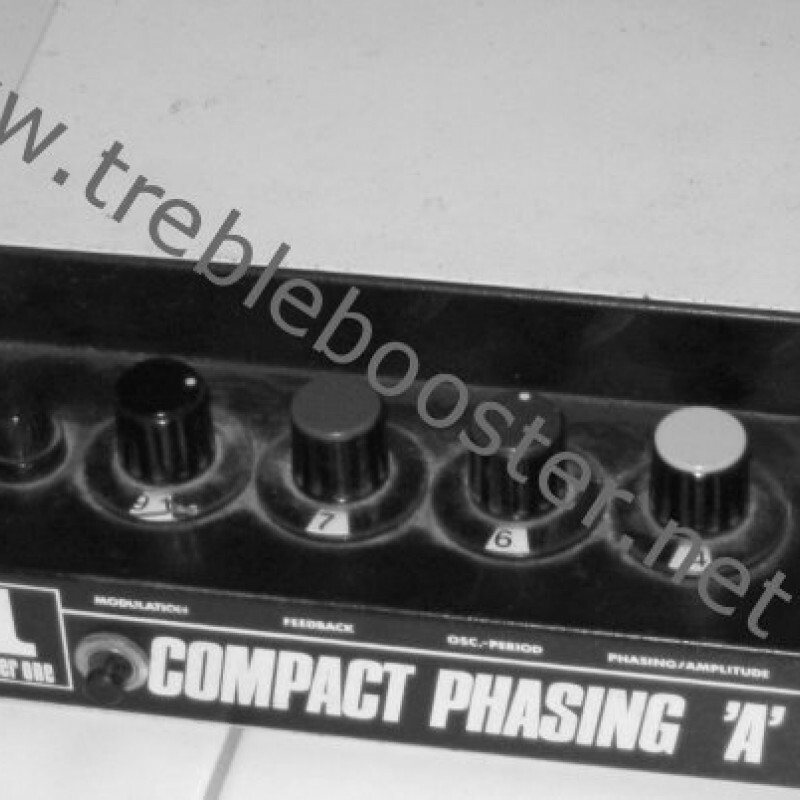 Settings: Gain: 10, Crunch 1 Gain: 5, Bass: 7, Middle: 10, Treble: 3, Crunch 1 Vol: 6, Presence: 0, Master A: 10. The very effective push-pull switches in the signal chain for sense, bright und preshape were not activated (“pressed”) at all. By the way, Ritchie used the more fine KT88 power tubes instead of the stock 2 x 6550. 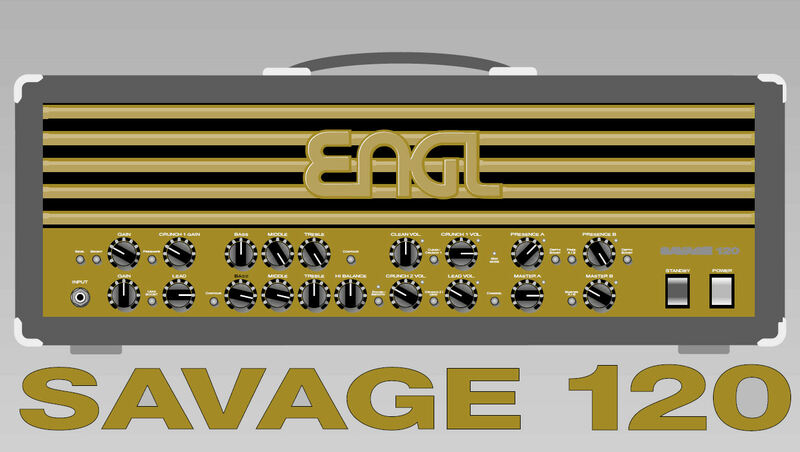 Some time later, ENGL released his own Blackmore signature amp (click H E R E to see a pic of the amp, and H E R E to have a look at the circuit drawing of the amp), based on the Savage, but tuned to Ritchie’s ideas and with 150 watts. Now Ritchie crossed the final landmark for his own signature sound. The common serial models had 100 Watts from 4 6550 power tubes, the 150 watts-model was discontinued after a short time and is really hard to find. 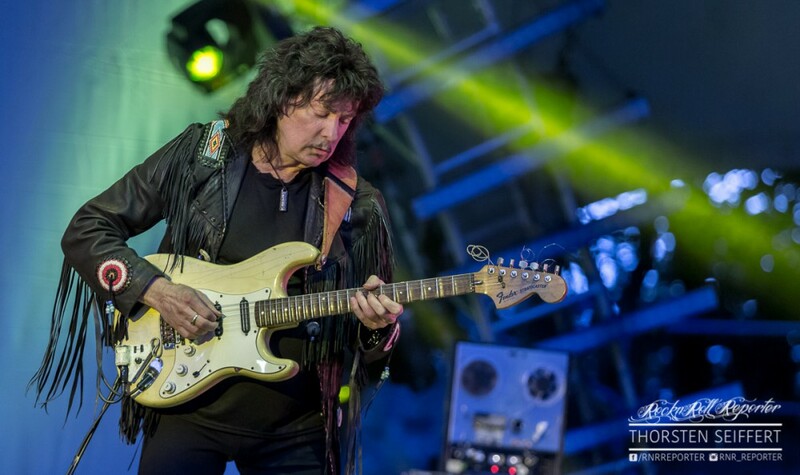 On July, 17th 2016 Ritchie returned to play Rock on the Loreley open air stage for the first of a limited series of 3 concerts (also Stuttgart and Birmingham) with a new incarnation of Rainbow. On the electric side he used the same gear as on the last Blackmore's Night tour. His trusty 1977 stratocaster but instead of the long time used Lace sensor gold pickups he had his pickguard fitted with double blade humbuckers in single coil size by OBL/Bill Lawrence. He also used 2 old ENGL Souvereign 1x12" combos. 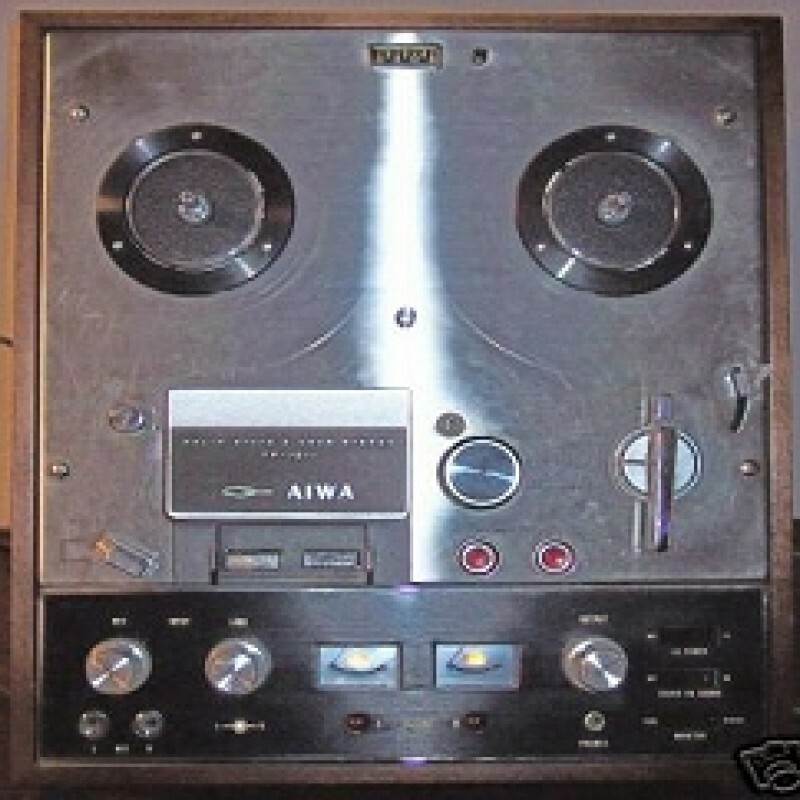 This time he did not only use the AIWA as a preamp but again as his delay machine with the tape reels. Even though he was playing hard rockin' music Ritchie got a great cristal clear percussive sound with less gain than in the years before. 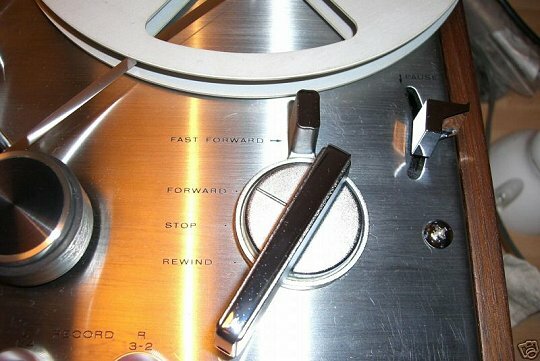 From the late 70´s on, Ritchie’s favorite studio setup includes a modified Marshall Major amp and his old AIWA reel-to-reel tape recorder as a preamp. 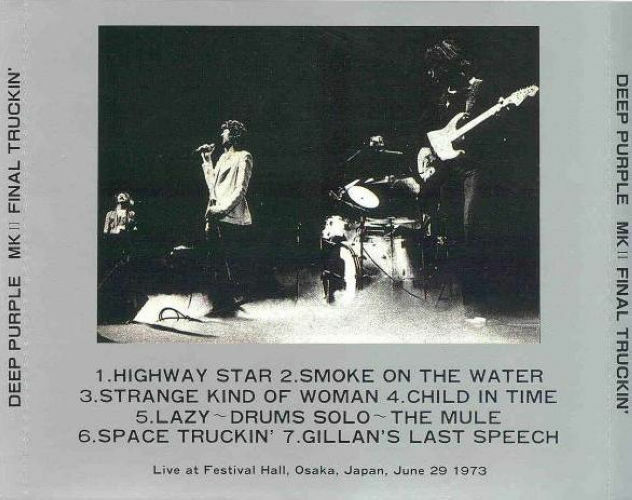 To record his amps and cabs, he usually used three mics: a Shure SM57 (approx. 10 cm in front of the cab), a Shure SM56 (approx. 1,5 meters away from the cab) and a Neumann U87 (approx. 50 cm in front of the cab). The German double ribbon microphone "Beyerdynamik M-160" was used quite often in the days of Deep Purple Mk 2/3 and surely on the earlier Rainbow stuff. 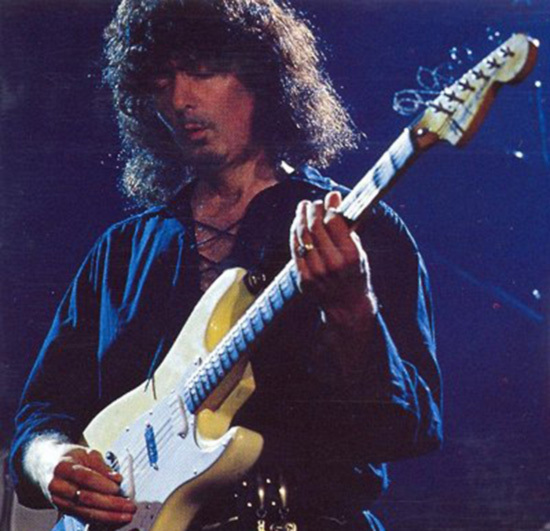 During his time with Blackmore’s Night Ritchie took off the tremolo arm from his Strat because he became fed up using it. He said using the tremolo bar was progressive in the 60s and 70s but has become too popular now. Therefore nowadays Ritchie relies on his finger vibrato. As for Rainbow and Blackmore’s Night studio work he often used a heavy weighted black Strat supposably with an ash body with a small headstock and noise free pickups of unknown brand. Ritchie liked this one especially for its great Distortion sound and used it mainly for solos. This must be the hum free guitar that Doogie White was talking about when remembering the Rainbow recording sessions. 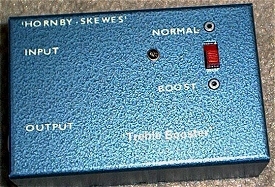 The famous Hornby-Skewes Treble Booster, used by Ritchie Blackmore. 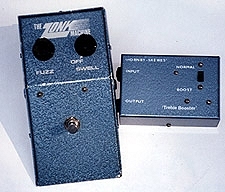 Originally the booster was part of the "ZONK Machine Set", a set of two stompboxes: a Booster and a Fuzz. 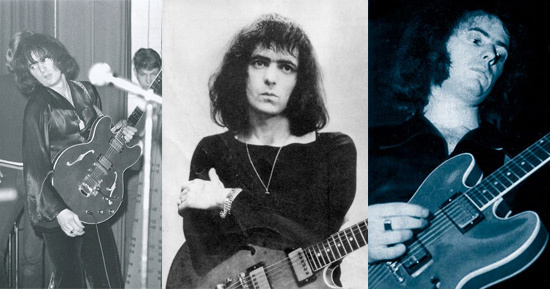 Ritchie Blackmore only played the booster, same with Martin Barre & Andy Scott. 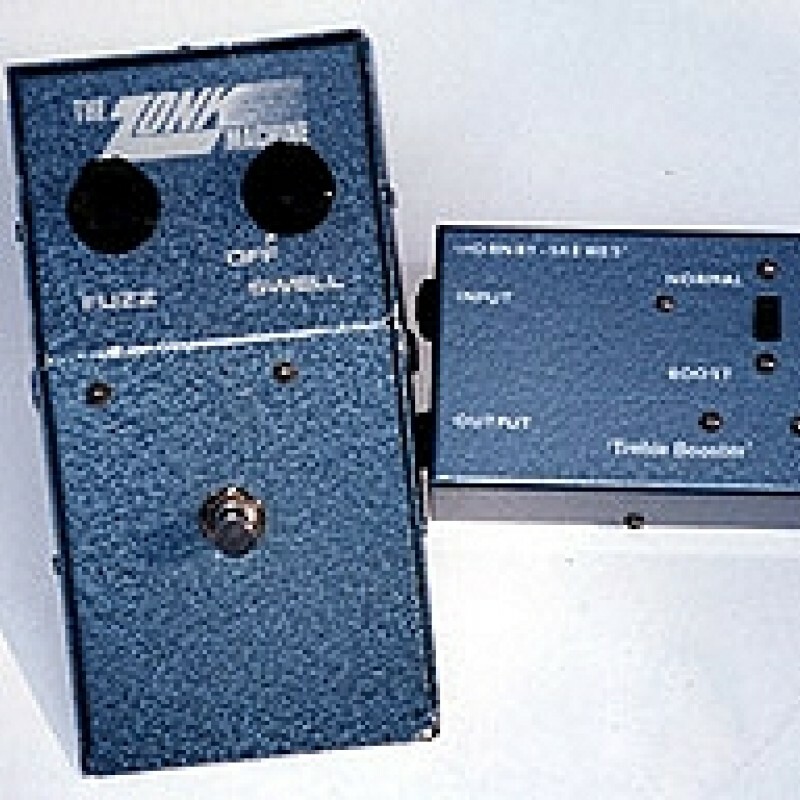 The fuzz box was a very close clone of the Maestro FZ-1A (well-known because of the sound of "Satisfaction" from the Rolling Stones), not very popular at this time, but at least you can hear it on some songs from Mark Bolan (T. Rex), eg. on the pretty cool "Electric Warrior" album from 1971. The Schulte "Compact Phasing A"
Ritchie's master Strat in 2010/ Blackmore's Night, fitted with 2 Lace Gold Sensors.